Good evening everyone. I did nothing yesterday and today it’s been jam packed with excitement and incidents. I rose relatively early and was under-way before 11 am. There seemed to be lots of traffic moving in both directions as I’d sat and had breakfast and that was sort of the order of the day. However shortly after setting sail and taking a bearing on the Shetland Isles, I do need a new map book, I came across a Heron stood at the side of the canal, not too unusual I agree, and he stood there as I approached and with camera in hand I thought I might get a decent picture and indeed I did. He stood stock still and as I passed plunged into the water and came up with his own breakfast. A rather pleasant start to my travels unless you happened to be the fish. I meandered along at a very sedate pace and met a few boats going north but none thankfully following me so I could cruise at my leisure. 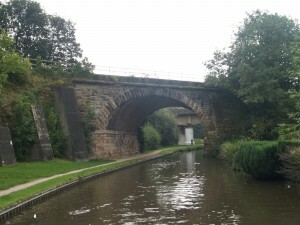 A sharp right turn and across the aqueduct which brings you to the outskirts of Rugeley and a 90 degree left hander. 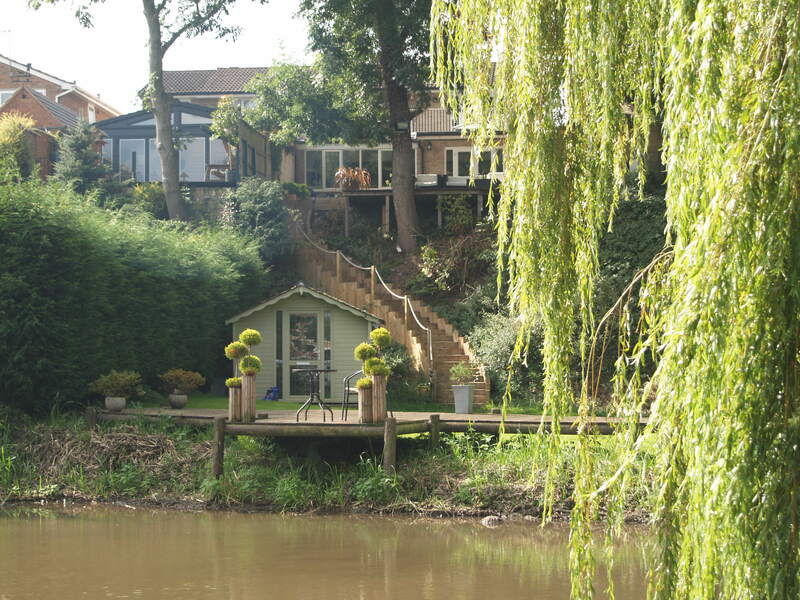 A straight run of houses all about 50 ft above you and gardens that drop down to back onto the canal. Here I was visited by more wildlife. This time it was a black butterfly with red on it’s wings. Not a Red Admiral as I can recognise those and I haven’t looked it up yet. I’m sure one of you here will know what it is. Now we are beginning to hit the town centre and I’m thinking of stopping to do a little shopping but after arguing with myself I decide not too. Is it me or do we often look to shop when actually, in my case anyway, I have enough to do what I want to do tonight. Sausage and mushroom sarnies. These are the Cumberland ones I bought from the canal side shop at Great Haywood and I raise my hat to them, they were fabulous. I’m going to work on shopping less and using what I buy and trying not to buy things on impulse. This will be a struggle. As I said on my way up I find These three little towns very pleasant. 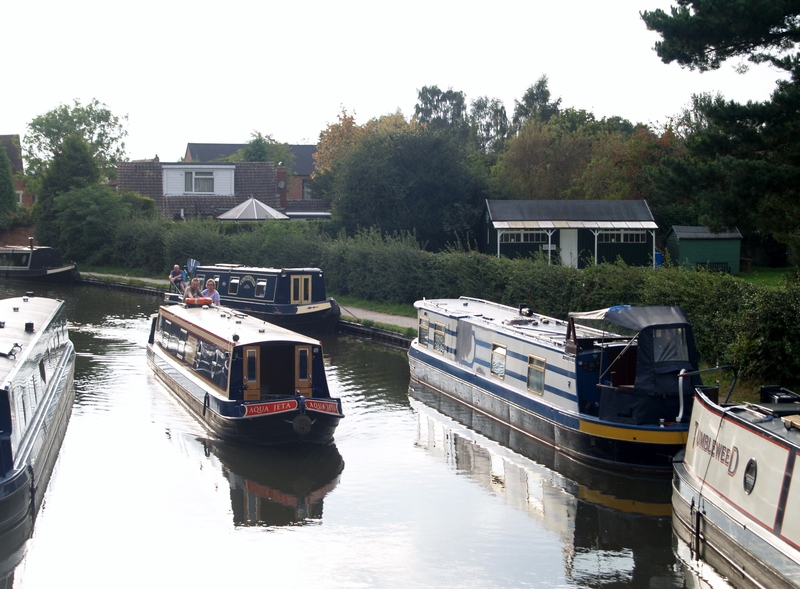 As you pass through the town centre area it does narrow down and if boats are moored then a bit of care is needed if you meet anyone coming the opposite way. Today I didn’t and slowly meandered my way through say morning to people and waving to others who were hanging their washing out in their gardens. The sun on my back and warm with out burning. This was turning into a rather appealing sort of day and was only improved when God spoke to me. No there wasn’t a peal of thunder and no I don’t and didn’t here a direct voice but I know it was him. I have a habit of complaining about others who aren’t courteous, or don’t slow down proper when passing, or don’t slow down when you meet under a bridge, or push in at the bar and that sort of thing. You may on occasions do this yourself. Well I got to this bridge and I was halfway through and someone came round the corner and they did slow down a little but by the time I could move right and get out of the way there wasn’t much room between us, a couple of feet, and I just thought why not slow down so you’re not almost threatening the other boat and as they passed and I shook my and said “Oh Lord is it me?? ?” The answer popped up and he said “actually yes it is you. These numpties will continue being numpties so stop whingeing smile and get on with it.” I thought well that’s fair enough. 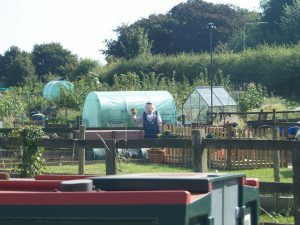 Now we leave Rugeley and visit Armitage, another lovely stretch of canal and up past Spode priory there are some allotments which I think look grand and I noticed today an old washerwoman scarecrow waving at me. Should I cut down on the drugs I wonder. A little further on and we come to what may be the only tunnel in the world that doesn’t have a roof. Did they build it for people who are claustrophobic I wonder. It does have a bridge built over it now which makes it like a tunnel again but apparently due to subsidence they had to take the roof off. 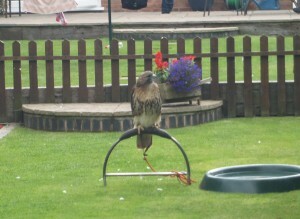 Next we have near death at the hands of a Buzzard, or should that be “wings of a Buzzard”. I digress but as I left Armitage hit Handsacre’s lovely waterfront bungalows and a very sharp left hand bend I spotted a Buzzard circling and he wasn’t very high so I grabbed my camera and slowed down and took a few photos of him and with my head up hadn’t seen this boat coming the other way. He however had seen me and slowed right down too. 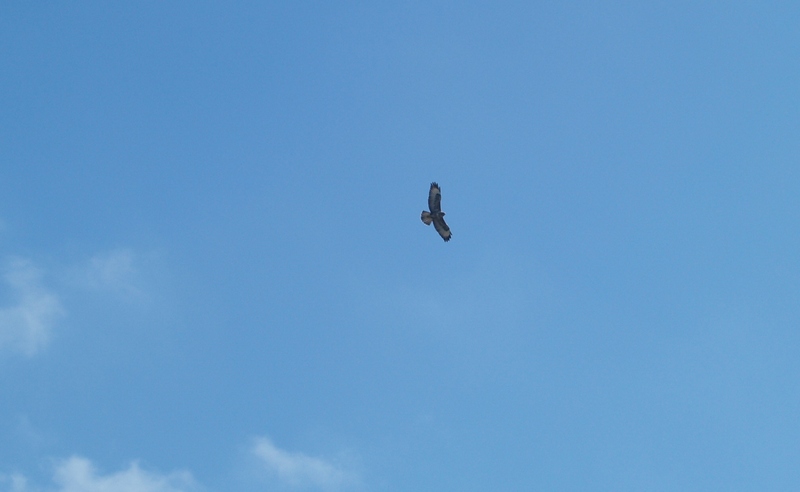 So I apologised and blamed the Buzzard, as you do, and he smiled and we continued our journeys. The stretch of canal from leaving Handsacre down to Fradley junction is to me a sheer joy. Tree lined and meandering with reeds and grass. Today with the sun shining down, the birds singing and something feeling just as it should it seemed to take on a new shade of elegance. An abundance of different shades of green. Water swirling behind and the sun high in the sky. If you can’t enjoy boating when it’s like this then it’s time to go home. 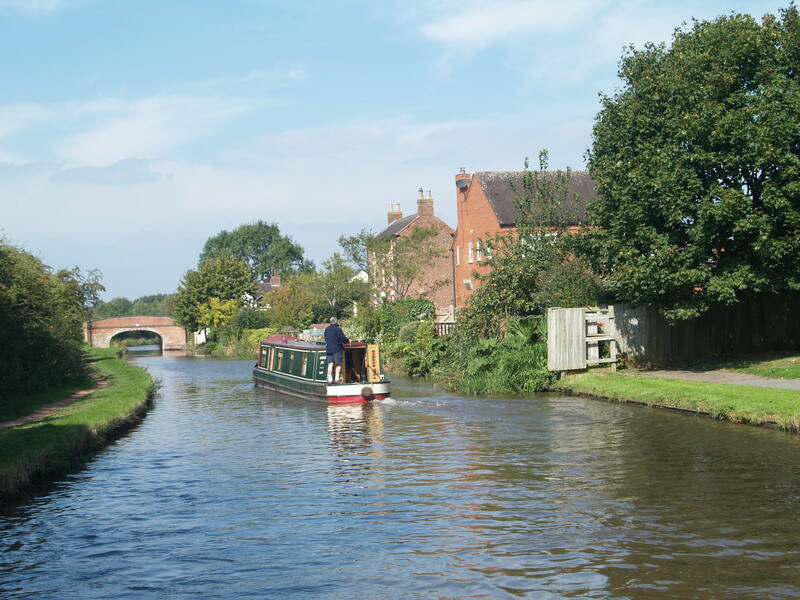 I met some more wonderful people at Woodend lock who helped me through, they were walking, so I offered them a lift down to Fradley, Jeff accepted but his wife Annie declined, I think she remembered what her mother had told her about accepting lifts from strange men. 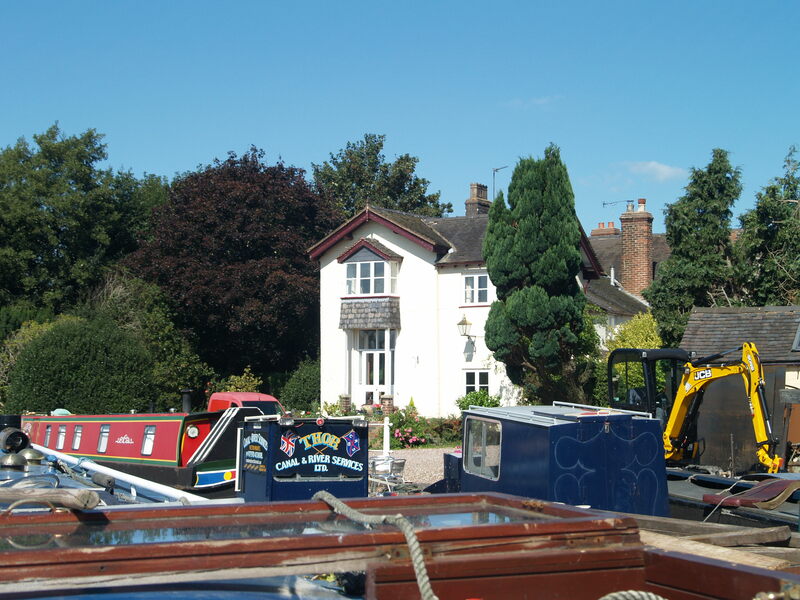 They had hired boats for years but were thinking about buying so we had a good chat on the way down to Fradley. 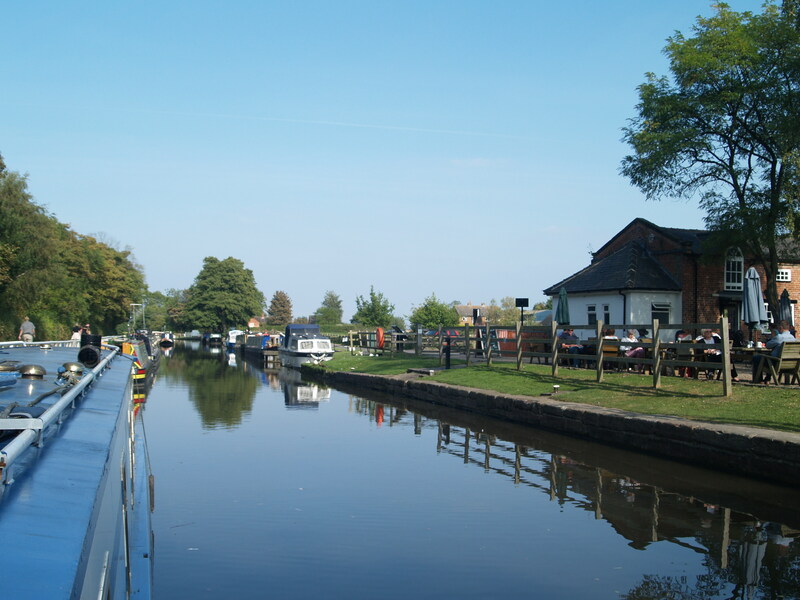 Jeff helped through a couple more locks and I left them at the Swan pub and dropped a further lock and was pleased to find a mooring waiting for me so I soon joined them outside the pub with a pint of Outlawed, for me a very nice pint indeed. Pint number two and then back for the sausage sarnies and to write this blog. This has been a truly enjoyable day. I feel at peace with myself and some of the world too. Photos; 1. Heron catching his breakfast. 2. 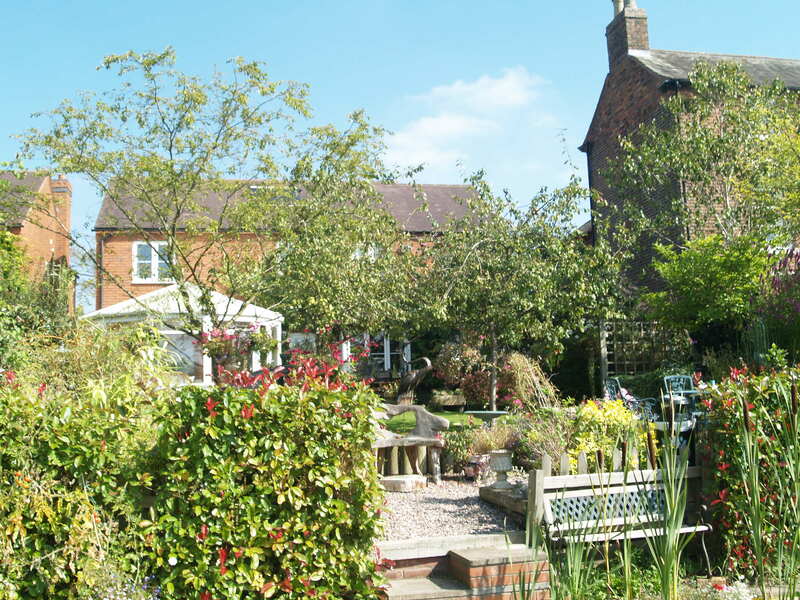 First garden as you turn into Rugeley, 3. A fore said butterfly. 4 and 5 Rugeley town centre area. 6. A beautiful bridge. 7. 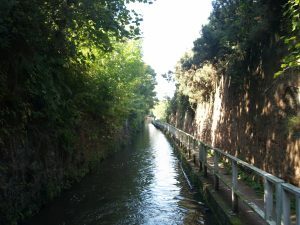 Armitage tunnel. 8. Allotments and Mrs Scarecrow. 9. The Buzzard and 10. My Fradley junction mooring. Hi folks doesn’t have the same ring as Lazy Sunday Afternoon by the Kinks but I’ve decided to recharge my batteries and have a day lounging about. I didn’t surface till 10 o’clock. Bone idle no excuses. I think it will do me good as I feel quite worn out after yesterday. Only 3 locks but a lot more pulling and holding the boat while queueing. My knee was giving me a little trouble last night and I couldn’t see why at first then realised I’d probably done more yesterday than other days. Wall to wall hazy sunshine and very warm. What to tell you about as I haven’t done lots. Half hour on the guitar this morning. 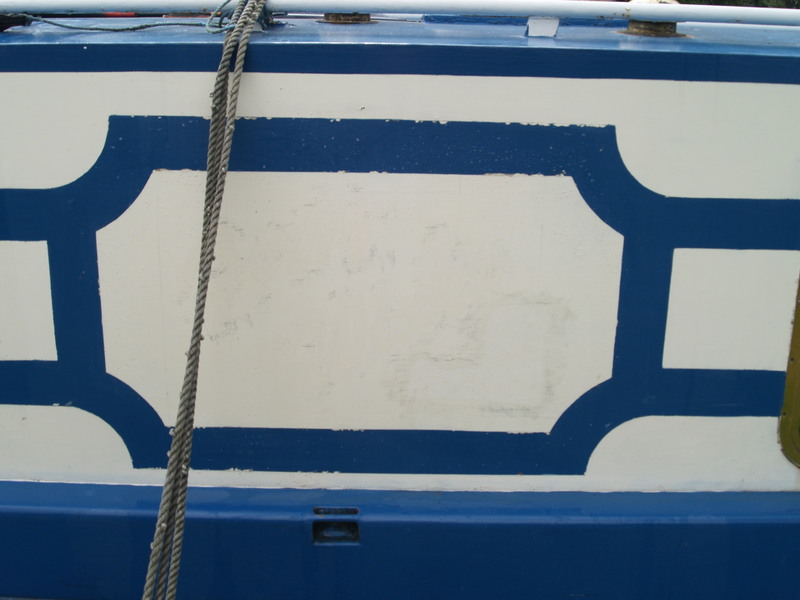 Then decided to mop the bird poo off the top of the boat and cleaned out the cruiser stern as it had got a bit untidy and dusty over the last week or so. This isn’t major surgery let me tell you, just a quick flick. I have however refilled my stern greaser and mopped the water out of the engine room. I get a bit of leakage when I’m moving I think it’s the age thing. The big question today is what do I take pictures of as I’m not going to be travelling and one field of sheep looks pretty much like another. I think I found 6 to keep you entertained or might be 7 and I’ll pinch one from late last night. While out travelling this last week and while washing the poo from the roof it has brought home to me how much in need of a paint job she is. 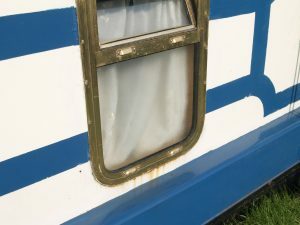 The windows need taking out while painting too as there are rust bleeds coming through. 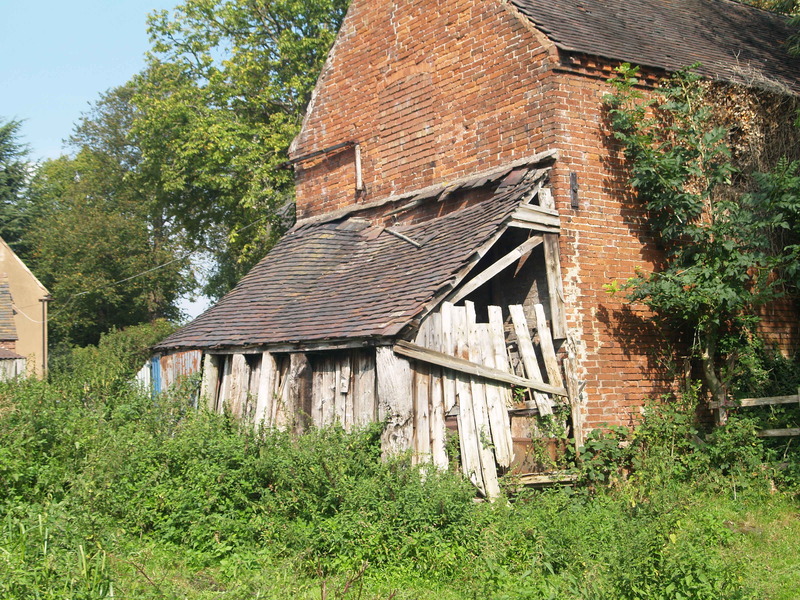 So while I don’t have many leeks yet, I’ve found one recently, sanding and undercoating and generally sprucing her up ready for next year has to be a priority over the autumn, winter, spring and early summer. Also having some hooks to hang windlass, mooring pins, chains, pegs and hammer on so everything is at hand when required. Organisation that’s what I need to do. Put things where 1. I might know where they are and 2. might be able to lay hands on them when needed, especially if in a little hurry. This sounds very helpful and similar to what I probably thought after last years trip out but progress could be made on my return to base. It’s been a relaxing and yet mildly productive day. Another session on the guitar and I think I’ve sorted out one of the songs I want to record. Read a little more of Andrew Marr’s History of the World. Only just started it but I’m finding it very interesting and thought provoking. Seems to be leading me down the anti establishment route in fact I may be revolting. Not sure I’ve phrased that right but there you go. The sun is just sinking down now and I shall be poddling through Rugeley and Armitage tomorrow. Might stop for a bit of shopping. Sorry it’s a bit short but normal service may be resumed tomorrow. Photos; 1. The crack of dawn. Well 10 o’clock actually. 2. A nice boaty pic. 3. One of the windows showing the rust. Not horrendous yet but needs tidying up. 4. My own little recording studio. Modern technology is an amazing thing especially when living in a smaller space. 5. 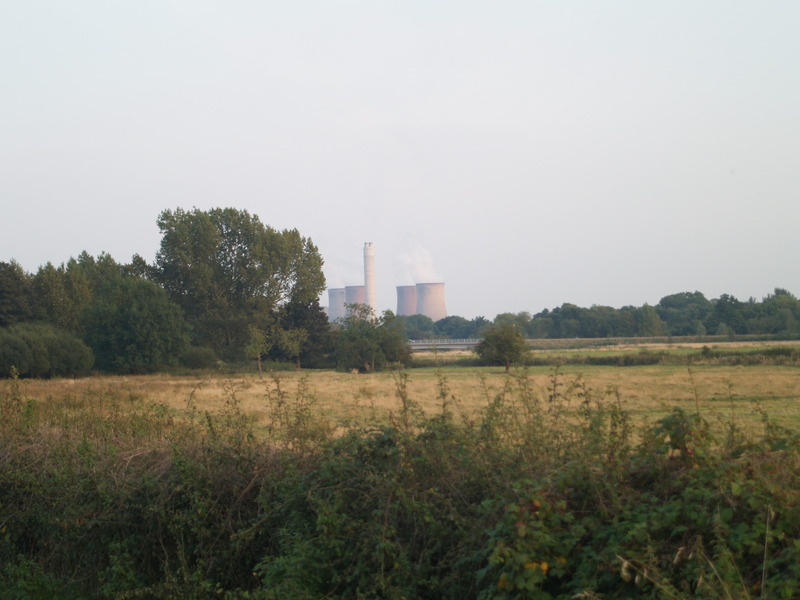 The power station peeking out at me. 6. 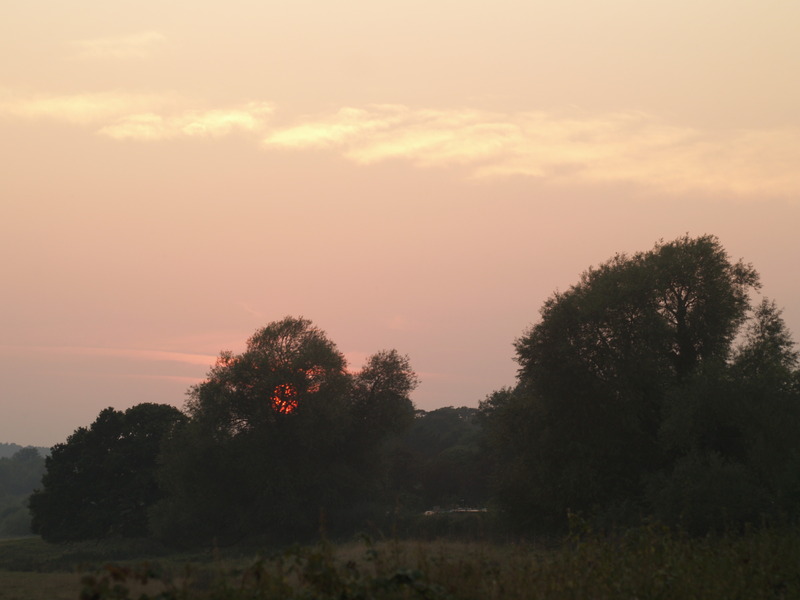 A lovely evening sun. 7. Last nights burning bush. Hi anyone. All the blogs should now have photos. I think I’ve found a cure but it hasn’t solved the problem. The last 2 days I put captions on the photos and it wouldn’t show them. So I took them off. Today has been a belter of a day. Wall to wall sunshine a little hazy but that stopped it burning so much. It’s now nearly 6 o’clock and it’s still lovely and warm. A lot of traffic today and a few of us were wondering if it is because the school kids have gone back and everyone is rejoicing. I’ve only done 3 locks today and have queued at them all. I actually managed to get moving before noon today. I think it was about 11 o’clock when I set out. Hoo Mill lock was a bit further than I thought it would be and rounding the corner I found someone waiting. There isn’t a lot of mooring there, about a boat and a half so I hovered for a little while before I could moor up and join in the fun. Someone right behind me once I did get it. All good kind folks and after a bit of a wait I continued on my way and enjoyed the warm sunshine. 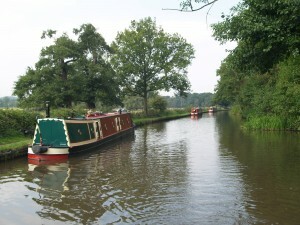 Moored up at Great Haywood and set off with rubbish in hand and a shopping bag. Rubbish dropped off now to find more supplies. I like the worst bits of meat really but like only the best so I had a couple of their own home made faggots, 3 links of their own cumberland sausage, mushrooms and a fresh wholemeal loaf, oh I nearly forgot I had one of their pork and shropshire blue sausage rolls which I had for lunch and it was delicious. Now the days acrobatics and excitement. I moved down a hundred yards to the water tap. I decided not to spin round and moor with water cap to the bank but manage with it on the canal side of the boat. I have 2 pieces of flat hose for watering 1 short one and 1 longer one but I still had to pull the boat back a little from where I had first moored. It is also very warm and I’m sweating like a garden hose to be polite. Anyway moved it back and the long one just about reached. Removing the cap was a little problem holding on with one hand while bending down and unscrewing with the other hand. I’m not as yound and agile as I used to be but the job was done. Now to get the hose in the top and do I switch it on first or not. If I put it in and turn it on and it flies all over and goes in the canal not very good or hygienic so I thought I would try it with the water on. Now if you’ve used a flat hose before you will know they tend to do a fair impression of an angry cobra doing a jig and it was nearly in then lept out then one side then shot over the other then miracles of miracles it went in and stayed in. Hooray, for Hollywood. I have a list now from this holiday so far of things to get or things to do or organise ready for my trips out next year. A proper hose on a real is on this list a long with a pole and plank rack and a few other things to help keep the roof tidy. 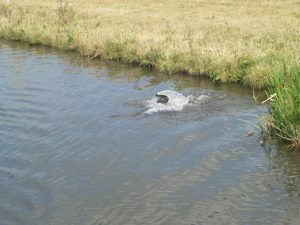 I managed not to fall in the canal either when I put the water cap back in place. Now I can venture forth again and join another queue of boats waiting down at Shugborough lock. I have to hover again as I’m fourth in the queue. It isn’t particularly breezy so it isn’t a problem. Now we all know there are some grumpy people about but these were all good folks and made it a pleasure to pass the time of day with them while we all waited and worked together. This applied to those in front of me and those coming up behind who would wait a little longer. The day was enhanced rather than detracted from by this. Through Shugborough lock and off into the great wide open all the way to Colwich lock where we all met up again and did the same once more. This would be most peoples last lock for the day that I’d met as I was hoping to moor up before Rugeley. The two boats in front of me were heading for Rugeley and they were son and wife in one boat and mother and father in the other, they weren’t live aboards so had bought two boats that fit in one lock at the same time. Saves time when your out cruising together. Very clever my dear Sherlock. The couple behind were heading for the Plum Pudding as they eat there whenever they are this way. Another recommendation for their Italian cuisine. I chugged off again thanking all of them for their help and hoping they had a great time. 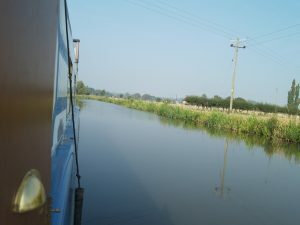 The sun was still shining and still nice and warm I cruised up through bridge 70 where there are some good moorings and took the first of the three single moorings just up from there. It gives you more of a feeling of solitude. Lovely views and the evening sun shines on you till it finally retires for the day. I have sat and done my blog after dining early today at 5 o’clock. I had the same as I did 2 days ago to finish the bacon. Real bacon, real free range egg with mushrooms and tomatoes. I did get my egg to perfection this time as I managed to poach it spot in. All the white cooked and the yolk runny so you can dip your bread in it and the tomatoes run in with the yolk and make it perfick. I’ve no doubt that a glass of fine cider and a tot of the finest of whiskies, Talisker, may accompany my reading or guitar playing later after watching the sun go down. Tomorrow will no doubt bring something else of interest and value. 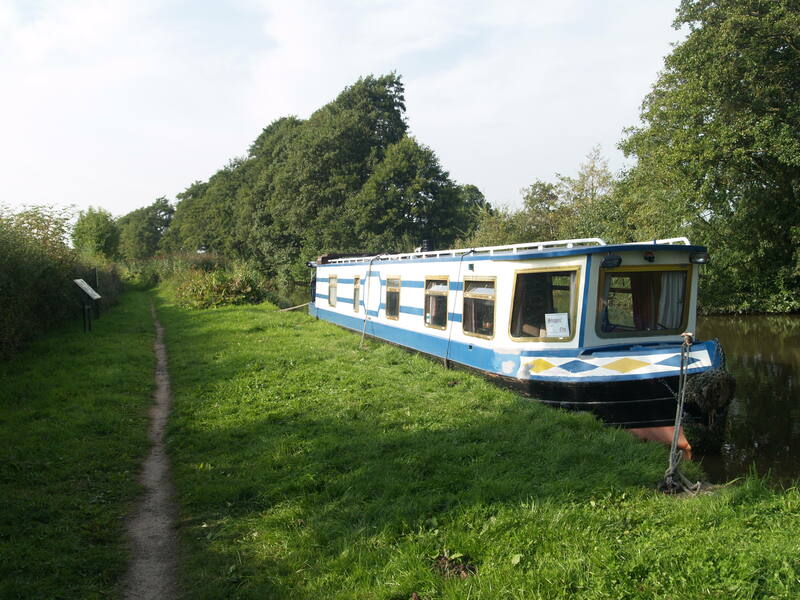 Remember we are all like narrowboats. We cannot be guided if we’re not moving forward, even if only slowly. Photos; 1. Morning from the back of the boat. 2. 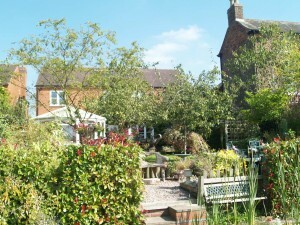 Great Haywood moorings opposite the canal side farm shop and cafe. 3. the flat hose running across the front of the boat. Sorry I couldn’t dangle there removing the cap and taking a photo at the same time. 4. 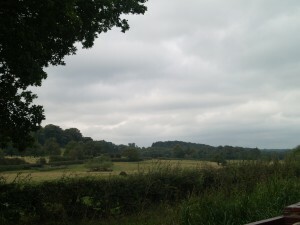 The view back up towards Shugborough lock. 5. A house with the largest rhubarb I’ve ever seen. 6. Some of the good folk I’ve met today who helped me and each other. 7. I just thought it had charm. I hope it didn’t empathise with me as it felt it had met a kindred spirit or I might not be in as good health as I think. 8. My mooring for the evening. Good evening to you all. 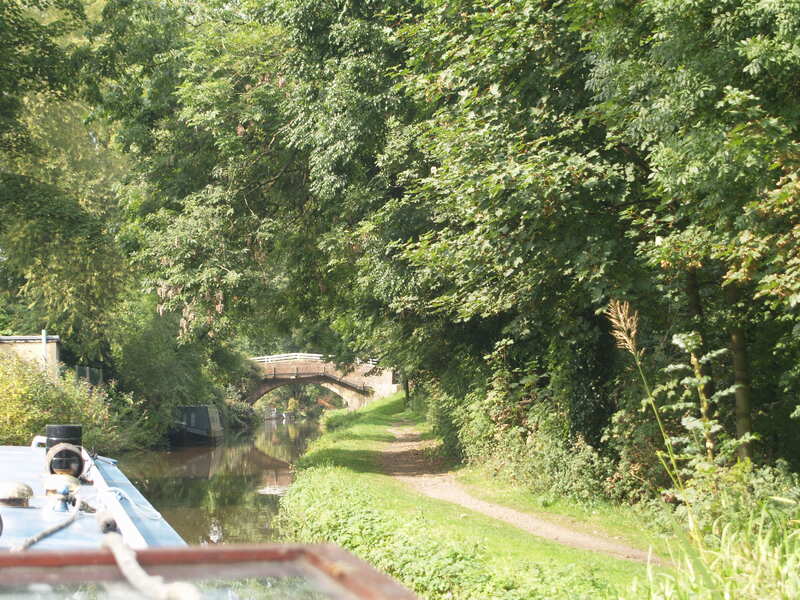 The sun is still burning the sky but I’m moored up by 17 o’clock as I want a bit of time to myself. I’m very selfish like that. I am in the middle of nowhere or it feels like that but after mooring up a man came past with his dog and then I spotted an articulated lorry followed by a car then followed by a bread van. These were about 50 yds away and now I have another boat mooring up with me. Bugger. I’m not really unsociable just fancied a night of total solitude. I shall try for that tomorrow then. I rose about 8 am and cheese on toast and coffee for breakfast. Had a walk into Stone as I’d spotted a shop with the title Yesterdays and a few bits in the window looked OK. I had a look in some of the other shops and then went back and treated my self to a wooden fruit bowl, a knife and spoon, 3 DVDs about or taken from the Hubble telescope, I hope they are good and I couldn’t resist a DVD with 1 episode of The Prisoner starring Patrick McGowan. I know how to push the boat out. £8.50. want somewhere pleasant down by the water and not unpleasant in the town part. Shops Banks and plenty of Italian restaurants. 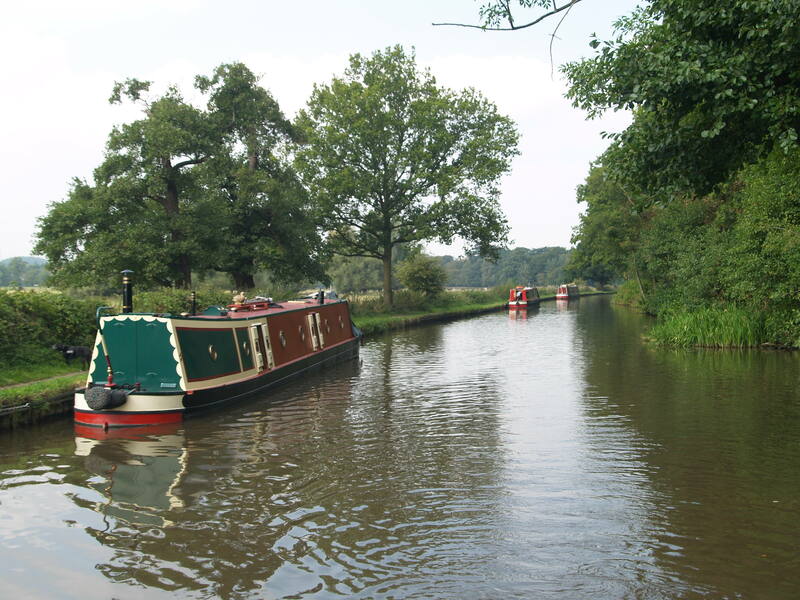 I wonder if this is a feature of the area as there seem more where I’ve moored up since up Great Haywood, Stone way than there is Derbyshire way where it seems more Indian restaurants. Choice is always good. On the way out of Stone there are a lot of properties that look out or back onto the canal and mostly modern with a few nicer older properties so those who prefer the land and can afford the prices can have nice home too. Some one coming up as get to the first lock of the day and when negotiating coming out I leave the boat in the mouth of the lock and nip up the stairs to close the gates, keeping an eye on the boat let me tell you as this, for me anyway, is a daring new adventure as I’ve always moored up and walked back to shut the gates. This is so much quicker. My first attempt going down which means you have to climb steps so are away from your boat. I did use this as well when I was coming up the locks and it works a treat but you are much closer to the boat if anything were to happen. 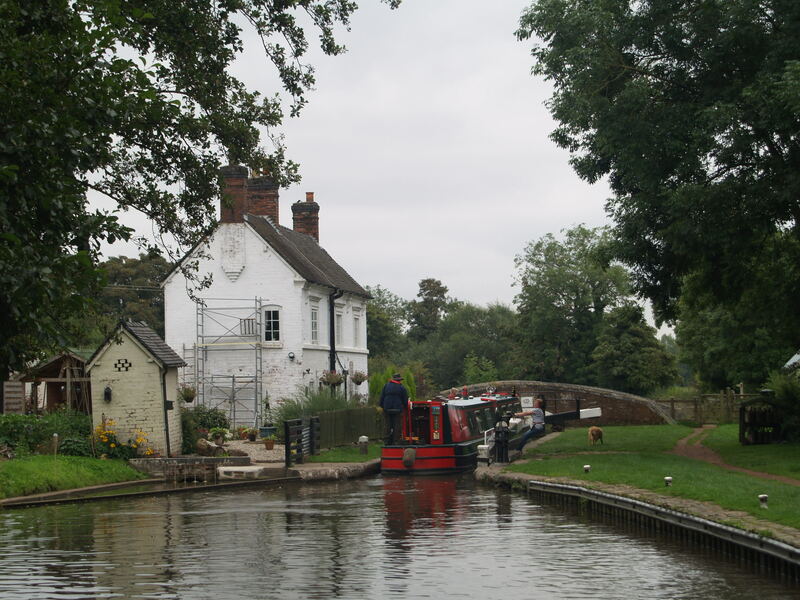 of canal down through Burston where there is a sign on the bridge advertising the Greyhound Pub then on again on again to Sandon lock which at the moment has a damaged bottom gate paddle so looks like it’s open even when it isn’t. It will still fill enough to let the top gate open properly. The gear mechanism on the damaged paddle works OK. Help again from some really nice people. There are some idiots and grumpy bums about but generally many more good people than bad I would have to say. 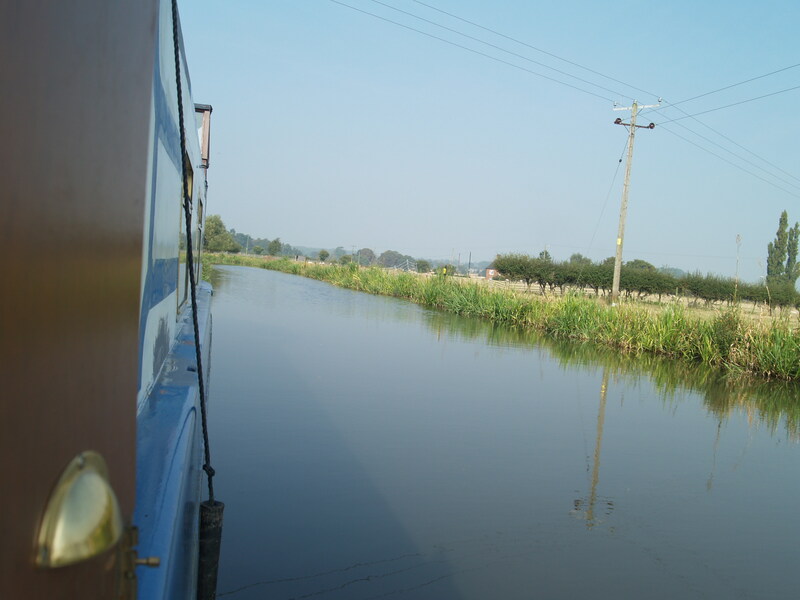 Lovely scenery as there is mostly and heading for Weston on Trent where I was half thinking of mooring up for the night. 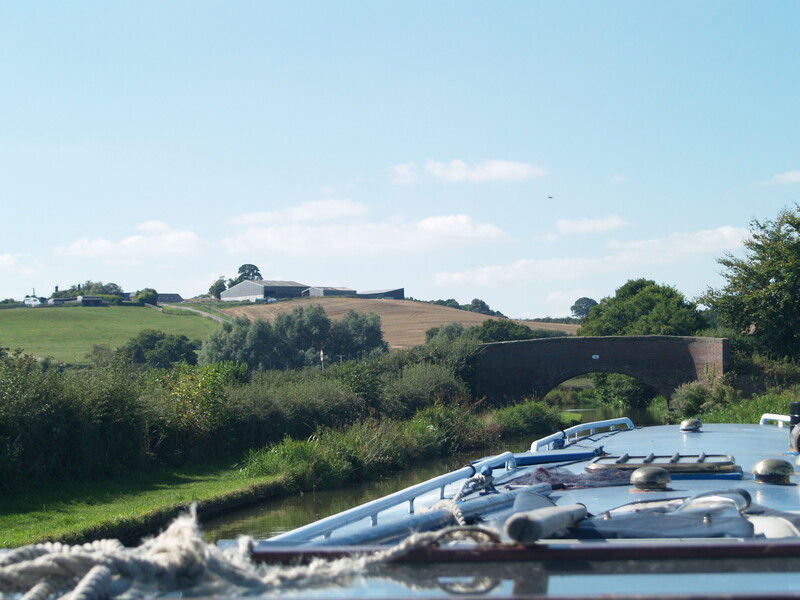 There are some decent moorings top side of Bridge 81 and a couple of gorgeous moorings between 81 and 80 which I managed to hesitate over as I was trying to take a photo at the same time and missed them, sod, and comfy walking distance to the Saracen’s head too. I’m a bit of a f…..ool sometimes. 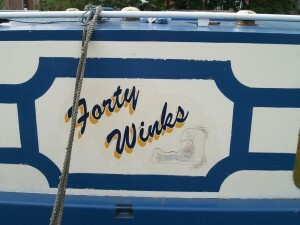 I was going to say fart but thought it might be too rude for the boating community. There are some more moorings bottom side of bridge 80 but no room was to be had so I soldiered on. and now there are a line of 4 boats. Well if I’m honest it’s not my canal and I’ve only paid about the same as everyone else and it isn’t like it’s intrusive or any of them are making a great deal of noise. I’ve just had a good listen as I write this and I can’t really hear any of them at all and 4 of them are out BBQing. take pics of but it’s been another great day and I’m fair dinkum tired Bruce. 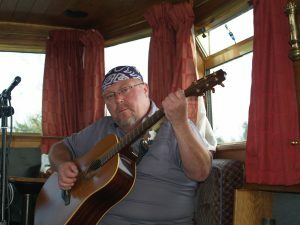 My plan for tomorrow is to try and move a little earlier and call at Great Haywood’s canal side farm shop then hope to find one of the three moorings on the edge of Cannock Chase and have 2 nights there so I can have a leisurely day and get a few songs recorded so I can put them on my YouTube site. This site has 2 of my own songs on already with a slide show background making it like a video so if you want to have a look then go to YouTube obviously and type in OurNige and the songs are called Sometimes and The Emptiness. More will follow once I can get them recorded then put the photos to them which also take a bit of time. Any way it’s getting near to bed time so I shall go lay my weary head down. of thick sliced smoked bacon, this butcher, Parr’s in Sutton in Ashfield, smokes it himself and it doesn’t produce white gobbets of water when it’s grilled or shrink hardly as it hasn’t been pumped with water in the first place. A friend I know keeps his own chickens so my egg was truly free range and rather delicious, grilled mushrooms and smothered with chopped toms with cinnamon, mint, and Italian seasoning. The hardships I have to endure in my quest for simplicity. Oh and a couple of slices of wholemeal bread and some brown sauce. Right then. Where were we. I didn’t surface till gone 9 o’clock this morning and a light breakfast and a coffee and took my rubbish down to the bins for boaters near the Anglo-Welsh boatyard. Steadily got myself organised. Dropped my pram-hood. Another benefit of which when out cruising is a little extra security, sort of. I know it doesn’t stop anyone but with the hood up and putting the side nearest the tow path in place it gives a bit more privacy people can’t see everything I’ve got lurking under my seat. The sun is beating down and the forecast is for the same all day and tomorrow then dry and warm but a bit cloudy till at least Thursday. I hope you all appreciate the suffering I’m enduring just to bring this scintillating report to your breakfast/supper table. Sun cream applied, bandanna secured, camera in place and a bottle of coke at hand we are ready to depart. So of we jolly well go. 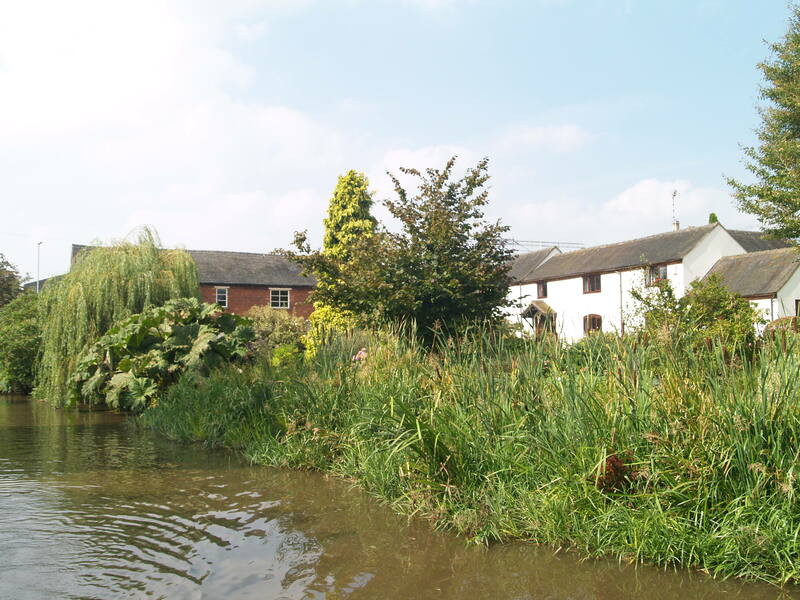 Plenty of private moorings along side the canal at Great Haywood so a while admiring or wondering at the condition of some then the moorings stop once you pass the entrance to the marina and it becomes more at peace with reeds, trees and rushes. 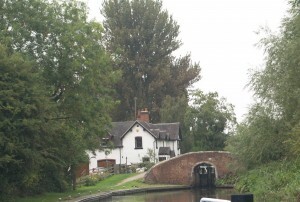 Then Hoo Mill lock appears. Someone comes out so I go in and someone waiting to come down so I don’t have to do anything at all to get through the lock apart from thank this wonderful couple for the help they’ve given. sunshine. 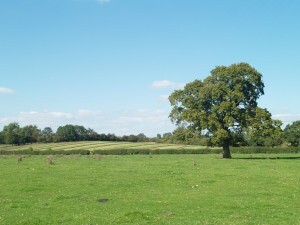 There is a noticeable breeze though which does affect you occasionally but no real hardship. A lot of wonderful open country side to travel through and some interesting and lovely houses to add variety to the journey. Weston lock then Weston on Trent which looks a nice small village and then a line of beautifully situated moorings. They may not have all the facilities but they do have the outlook. Turned the corner and a row of about 20 or so anglers. I thanked most of them as I went past very slowly. Some spoke, some were pleasant and none were rude. 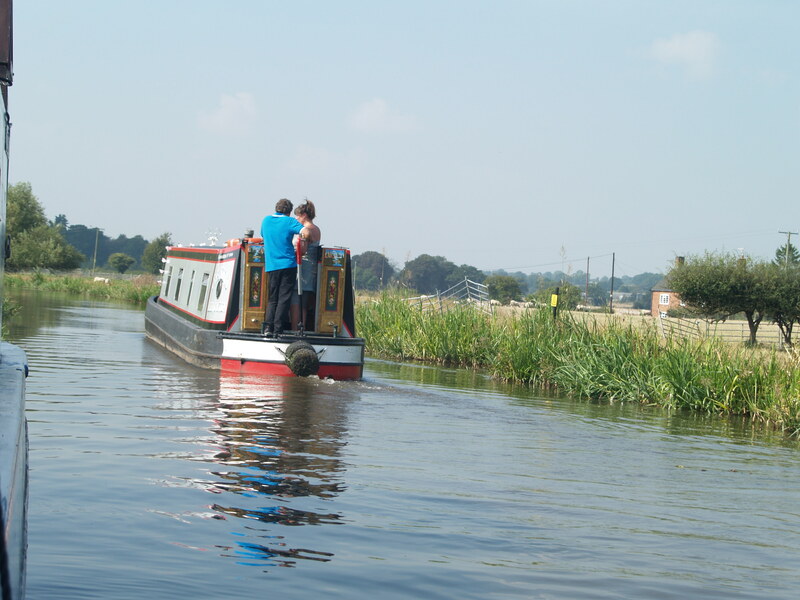 Boaters and fishermen have to learn to get along as in the end we need each other to keep the canals and rivers in the best condition for all of us to continue to enjoy. Now Sandon lock. Oh a bit of good fortune for me again as at the last lock and again here the boat behind as caught me up helped me through the locks so I’m still not doing them on my own really. In fact I’ve hardly done any in the 6 days I’ve been out. Again nice people. Many, many thanks. The country side rolls on as do the miles and the sun keeps beating down and I apply more sun cream to the side of my face which now feels a little hot under the continuous sun. We of the Cloud Appreciation Society see the benefits of our friends the clouds not just to add beauty to a dull all blue sky but a little respite from the blazing sun we continually get in the summer. ?????? arrived and as they got their windlass out I realised I hadn’t dropped the paddles in the bottom gate. If I’d been on my own I could have been there for a while. She did agree with me that I shouldn’t really be let out on my own. Anyway through the lock then into Stone. 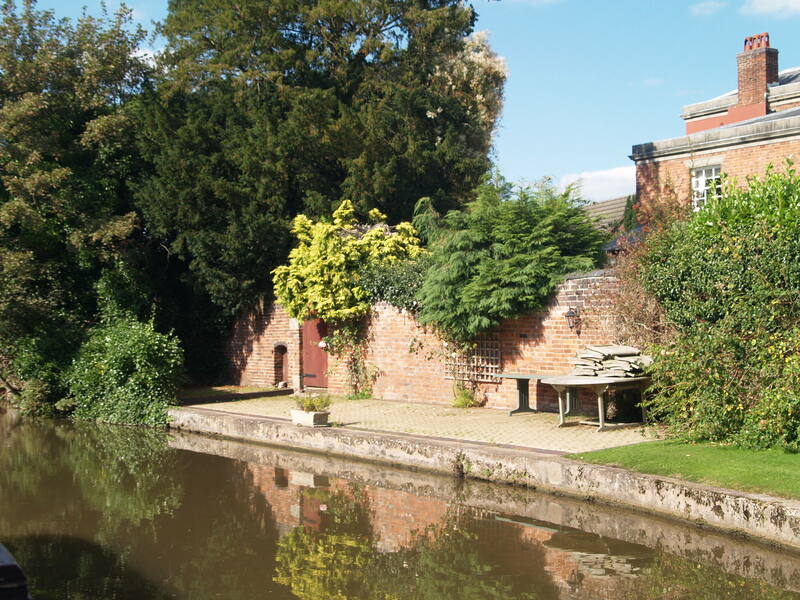 It is quite a way from this lock up to next lock and the Star public house and a mooring was to be had about 400 yds down from it. point. I walked past the star and sort of headed left then followed the road round and eventually found a couple of banks to withdraw some loot. A walk through the now deserted shopping area and back down to the Star where I tried a pint of the Bank’s Sunburst which advertised a light fresh citrus flavour and indeed it did deliver. A really clean, tasty and wholesome pint it was then back to base for the previously described bacon, egg and tomatoes and write this blog. Who knows what tomorrow may bring. Tomorrow, tomorrow, I’ll love you tomorrow, it’s only a day away. I could write for musicals you know if I tried. I stepped on to the hamster wheel in September 1977, almost exactly thirty seven years ago and I’ve been on it ever since running as fast as my little legs could carry me, never seeming to get anywhere or to have any time for myself and the leisure activities I enjoy so much. I was a very green behind the ears sales assistant in a down town timber merchants in Birkenhead. A year later I moved to another branch with the same company next to the river Clyde in Glasgow where my father was managing an animal feeds mill. After a very exciting six months, which included me being thrown off a moving coach during a very drunken Burns night in Stirling with my work mates, I moved back to England again, this time near Chelmsford in Essex. I worked as a progress/liaison clerk (I’m still not entirely sure what that was) and then as a senior contracts clerk by day and then behind the bar in a very select village pub by night. I regularly worked seventy hour weeks between the two jobs. The habit of working very long hours stayed with me over the following three and a half decades. I loved my part time job at The Anchor. I worked hard, but played even harder. My evening’s work often finished in the early hours of the following morning after two or three hours socialising with customers after my shift finished. I was offered the position of bar manager there so left my day job to work in the pub full time. In 1982, at the tender age of twenty two, I was given the opportunity to run my own bar. The training included six months on the relief circuit. I travelled all over the country looking after pubs while the regular managers took well earned holidays. My first relief couldn’t have been more different from the busy but select country pub I was used to. It was a rough estate pub in Harlow where a hard drinking session was usually followed by an even harder bout of fisticuffs in the bar or the car park outside. The grande finale of my month there was a bank holiday brawl which needed two dozen policemen to sort out. 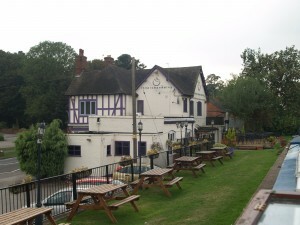 I looked after some equally interesting pubs after that including one in Brentwood in Essex which was supposedly haunted by the ghost of a murderer who spent his last night there before being hanged. I don’t believe in ghosts but each night I spent there on my own terrified me. I took a knife with me if I ever needed to use the bathroom in the middle of the night. I’m a bit of a wimp really. Just after my twenty third birthday I was offered my own pub on an estate in Milton Keynes. I can’t say that I really enjoyed it. Milton Keynes was a building site then and many of my customers were hard drinking Scots who had moved to the town for the work. They made my life a misery. After eighteen months of battling drunks I was sacked by the brewery for not controlling the costs properly, or even at all. I had nowhere to go so I squatted in the pub for three months before being literally thrown out onto the street by a pair of burly bailiffs. I should have quit the pub game then, but I wasn’t very bright. I secured a job in Putney as the assistant manager of another pub. Within a year I was back on the relief circuit but this time in a far more dangerous part of the world. Part of my training was in the King & Queen pub in Mottingham in south east London. It was a violent place. On one particularly memorable night an unhinged and very drunk local ran into the pub firing a magnum into the ceiling. I reluctantly climbed across the bar to help the manager relieve his of the firearm before throwing him out. We didn’t bother to phone the police. I then spent eighteen months running my own pub at Grove Park between Bromley and Catford. I witnessed a murder and an uncountable number of serious assaults and was hospitalised myself when I had a pint glass broken against the side of my head. My almost severed ear was stitched back in place and I was back at work the following day. I finally left, very quickly, when drug dealers threatened to kill my eighteen month old son. I moved to another pub in the not-so-sleepy market town of Bicester where I had some interesting nights separating drunken soldiers from equally drunken groups of Irish M40 construction workers singing IRA songs. The pub was far more placid than the one in London but after five years of regular Friday and Saturday night violence, I said goodbye to the licensed trade and moved to Southam in Warwickshire where I started my own cleaning business. The hours were just as long as they were in the pubs and I earned less but I didn’t live in fear. After five years hard labour I had a successful business providing domestic cleaners to affluent home owners and a small fleet of vans of vans offering a high tech window cleaning service to 800 local households. I decided to duplicate the business’s success across the country by opening franchised branch offices. I set up one in Blackburn, another in Glasgow and a third in Bournemouth before I realised that the expansion programme had sucked all of the profit from my core business and left me with debts I couldn’t service. The lovely people at Revenue and Customs forced me into bankruptcy so for the first time in thirty years I was out of work. Ever a glutton for punishment I landed myself a job as Operations Director for a fledgling soft drinks franchise. I commuted four hours to and from London every day for a year before discovering that the guy behind the company was wanted by Interpol for a multi million pound telecoms fraud in France, was suspected of having something to do with his wife’s lover being found handcuffed to the steering wheel of the family Mercedes when it was lifted out of Swansea harbour, and further suspected of being behind the disappearance of £500,000 raised by a London finance company for the company’s development. I left the drinks company then spent a year as professional photographer providing studio quality photographs at black tie events and, on two memorable occasions taking photographs of fans holding the FA cup at both Chelsea and Liverpool. I often returned from the events at dawn absolutely shattered. I couldn’t keep it up for long. 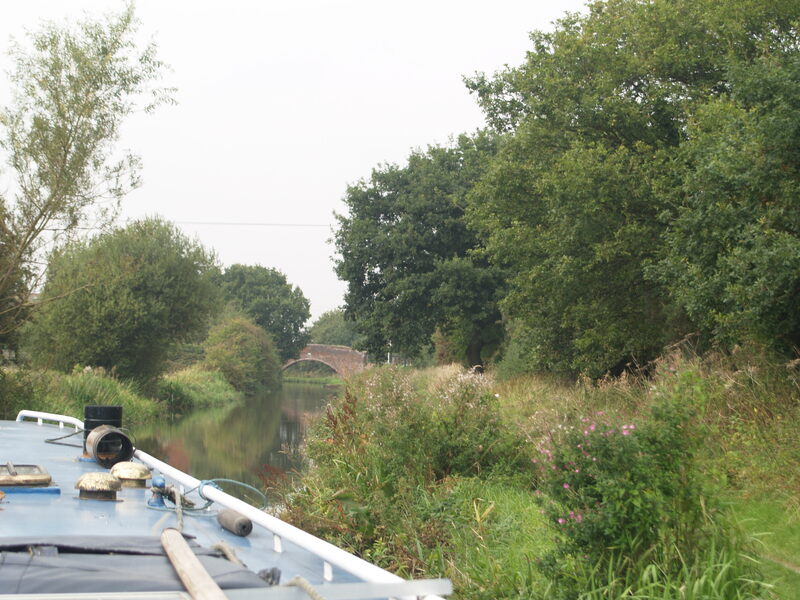 And then, quite by chance, I was introduced to the wonderful and tranquil world of the canal network. 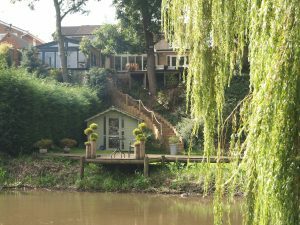 I stopped my photography work and started working part time helping to look after the grounds at Calcutt Boats. 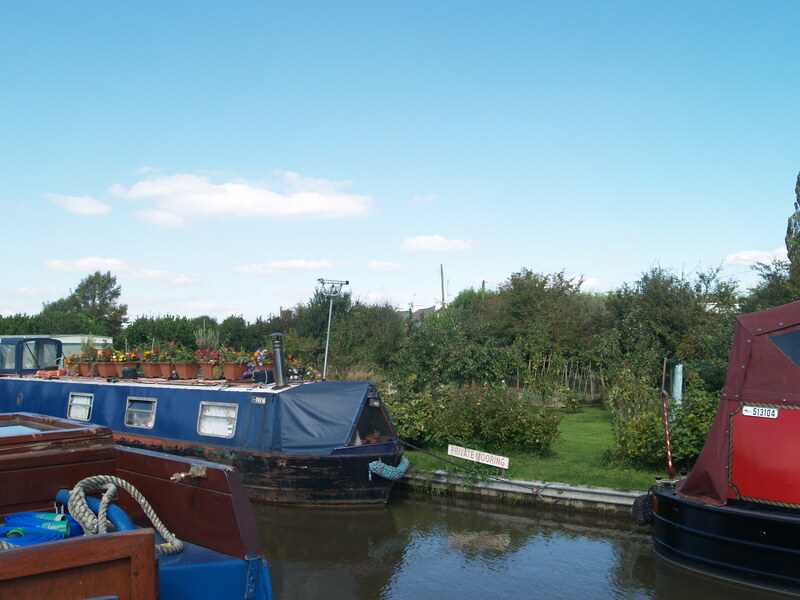 I loved every minute working on and around a marina full of narrowboats and the happy smiling owners enjoying holidays travelling at less than four miles an hour. I earned very little money but I was happy for the first time in many years. Part time work at the marina became full time. 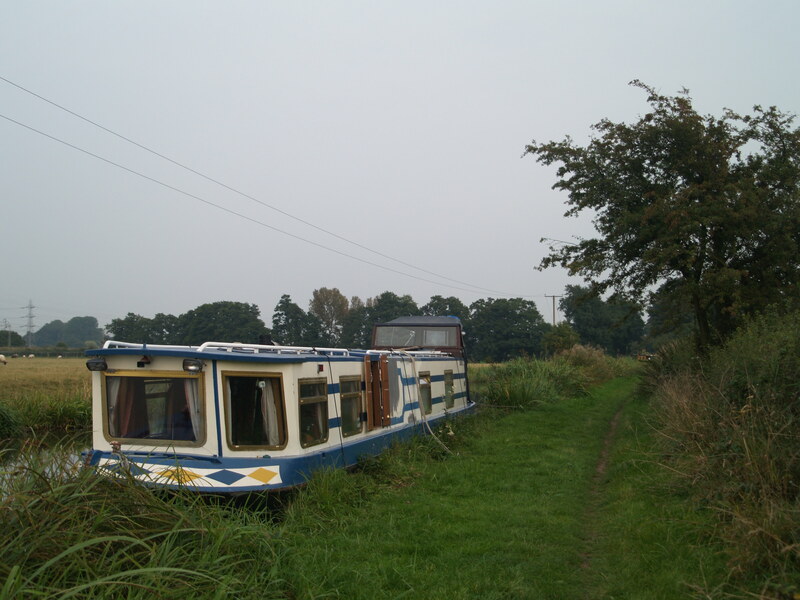 Commuting three miles to work from the house I shared with my wife became living on site on a dilapidated narrowboat on my own. Then I created this site and spent an increasing number of hours each week working on it. So here I am, thirty seven years after leaving school. still working close to seventy hours a week. The big difference is that now I thoroughly enjoy every minute of the two very different jobs I do. By day I’m a labourer. By night I’m a blogger. I lost everything including my pension when my business failed so I had to start from scratch to generate an income to support me in my dotage. This site with the products and services I offer is my pension. I’ve achieved the goal I set for myself four years ago, but it’s been hard work. I don’t mind hard work. In fact I’ve reveled in it as long as I can remember, but the hard work seems to be getting harder and harder. I’m no longer able to shrug off the effects of a full day’s physical labour or fourteen hours hunched over a keyboard after just a few hours sleep. I’m constantly tired. Sadly, it’s not the first email I’ve received along these lines. I know far too many people who worked hard throughout adulthood in order to enjoy a comfortable retirement to find that their health failed before they could turn dreams into reality. A particularly memorable example was a single guy I met at Calcutt Top Lock a couple of years ago. He told me that he and his wife saved every penny they could over three decades to buy the boat of their dreams. 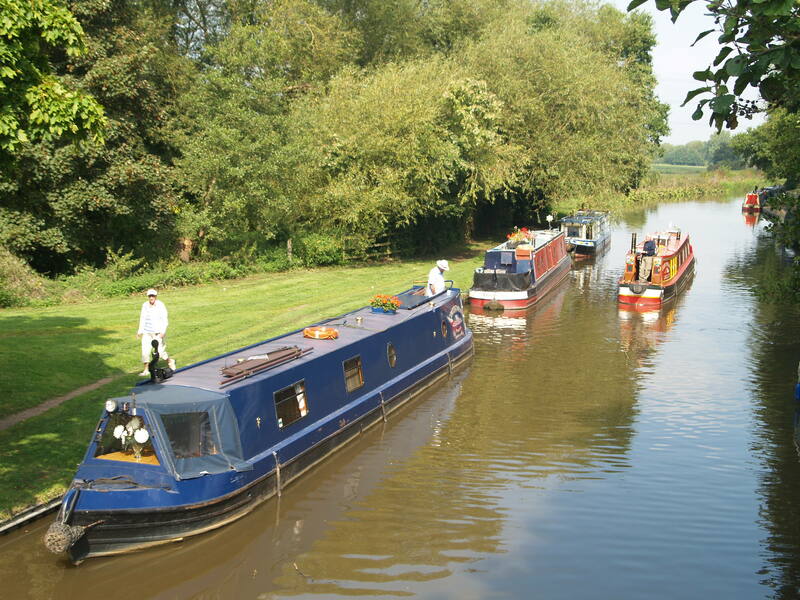 They spent many an enjoyable evening planning the boat’s layout after cruises on hire boats spanning many years. They bought a full set of canal guides and carefully planned the itinerary for their first summer of leisure together. 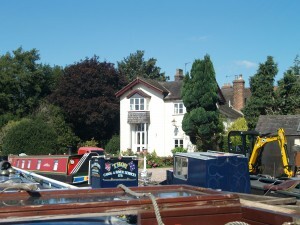 They chose a builder together then visited the boat yard each week to watch their new floating home take shape. The husband retired from the engineering job he’d endured for twenty years then waited eagerly for his wife to do the same the following month. Tragically, she suffered a heart attach and died the week before her retirement party. 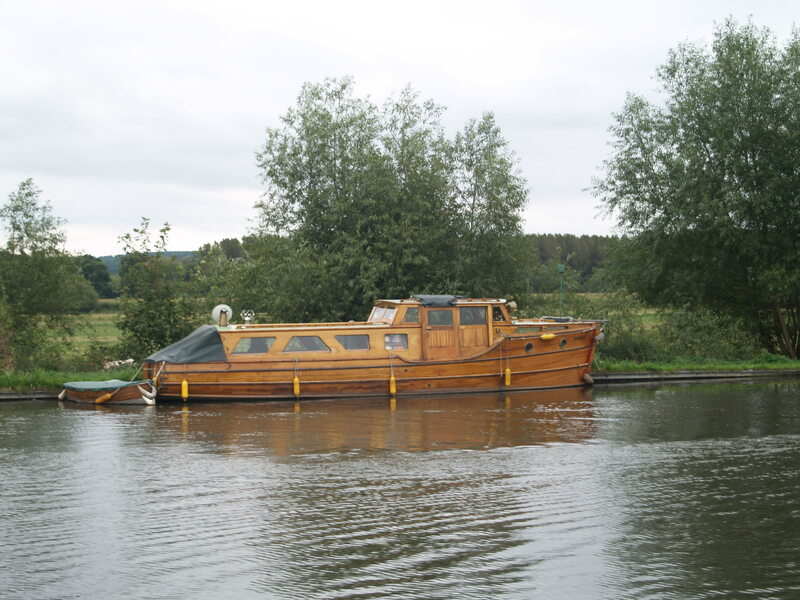 A month after her funeral and cremation, their dream boat was launched. It was a sad affair but the husband was determined to use the boat for its intended purpose so he set off on his own. 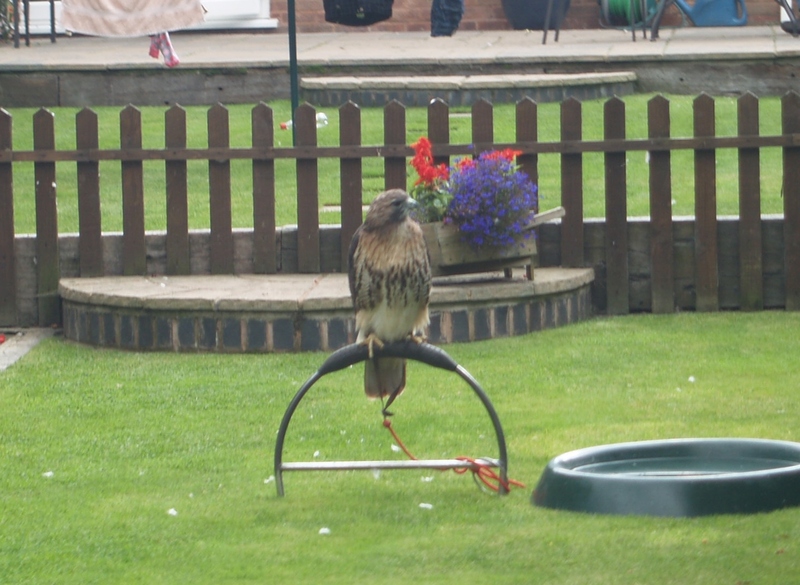 When I met him he had been cruising single handedly for just over a year. 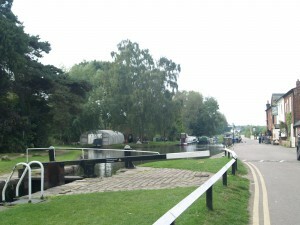 He was standing next to the lock with an open rucksack at his feet. Coincidentally I was standing at a lock today telling a passing boater this story. 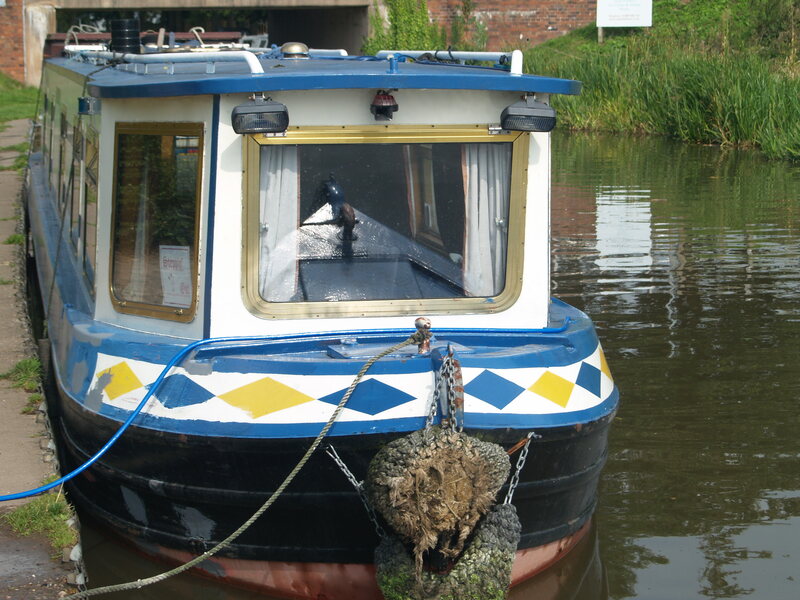 He told me that on my travels today I would pass a moored boat called Dot’s Dream. Dot of course had sadly passed away before she could realise the dream. Her husband had named the boat after her and now cruises the network on his own. Enough is enough. I’ve taken the bull by the horns and drawn a line in the sand (sorry about the mixed metaphors). I’ve set a date for the start of my grand adventure. That date is 2nd April 2016. It’s my 56th birthday. I’m going to try to move the date forward if I can but I need to satisfy an outstanding financial commitment first. I’m going to try to set off before then but I certainly won’t set off any later. I have thirty seven years of relentless work behind me and just over a year ahead of me. I can’t wait to see it all behind me. I now have a countdown timer on my laptop’s desktop and another on my phone’s home screen. There are 573 days to go before I set off on a cruise which I hope lasts the rest of my life. I’m going to bed early tonight so I can cross another day off the total. “You mentioned at the end of your newsletter about checking for stoppages. 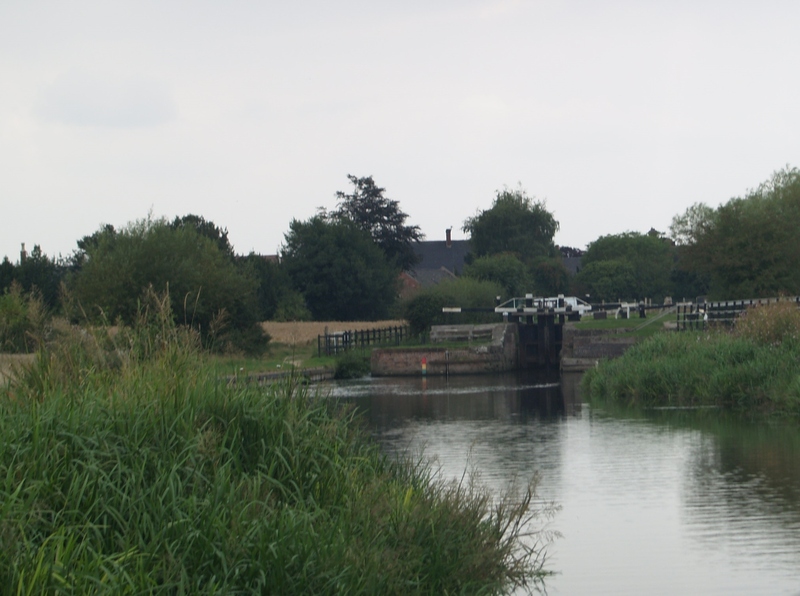 What is useful with the Canal and River Trust website is that if you set yourself up as a user with a login name (e-mail address) and password then there is a ‘MyTrust’ section. 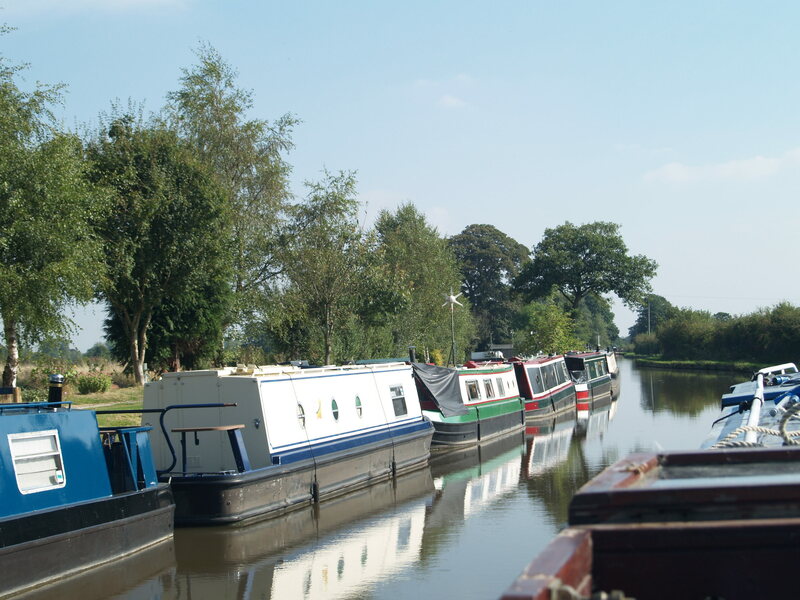 In here, you have the option of setting up a personalised notification of waterways by simply ticking the waterways that are of interest to you and you then receive E-mails advising/updating you of unplanned closures. You can view all stoppages here. Scroll down to the bottom of the page to register yourself so that you can receive email notifications. 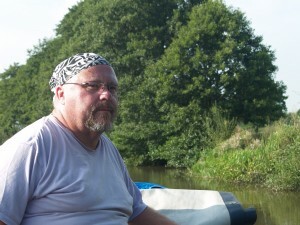 Nigel Buttery, Our Nige on the forum, has been living afloat for just over a year now. Like me he has to work for a living so he’s based at a marina, but as often as possible he takes his floating home out onto the canals to explore. He’s out and about at the moment and he’s recording his daily travels in fascinating detail. His day to day activities are typical of a relaxed and grounded live aboard boater. Here’s his account of the last five days in date order. If you want to comment on his posts you can click on the link at the bottom of the page to the duplicate post on the forum. Good evening folks I’ve just had a really good day as I’ve been joined by a couple of friends and their eldest son, who is off to live in America very soon and it’s been lovely. A gentle start and it really is a lovely place to moor between Rugeley and Little Haywood with the Chase open on your left, lovely. I set off to meet up with Tom, Julie and Richard and meandered up the canal just enjoying the countryside, the birds and life in general. 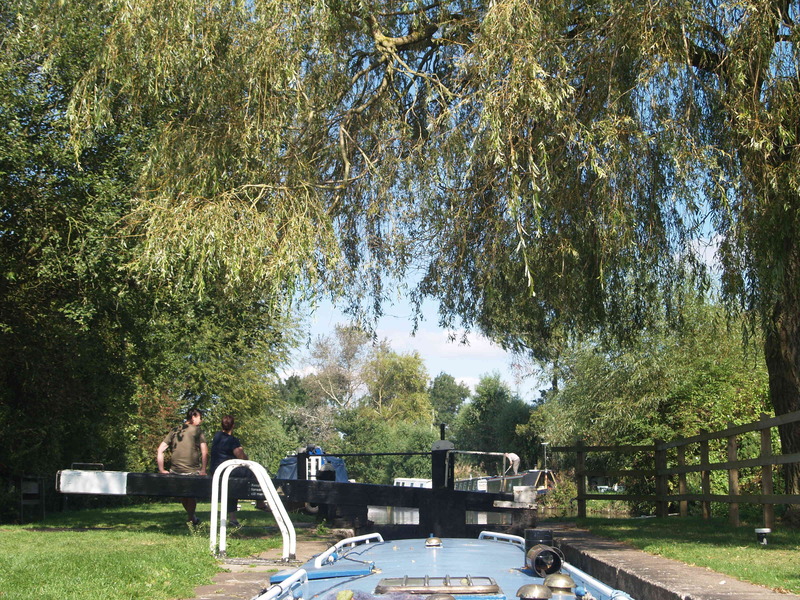 When I got to Colwich lock I pulled over on the lock moorings but someone coming down so just held her there for a few minutes and straight in. A couple coming down so I didn’t even have to get off the boat or do anything. Lovely people and many thanks. I’d arranged to meet them at Shugborough lock but then changed it to the canal shop for ease of parking and dropping them off after a day out. 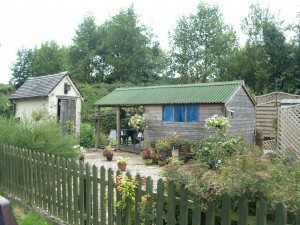 When they arrived we had a look round the farm shop and bought some things for lunch. 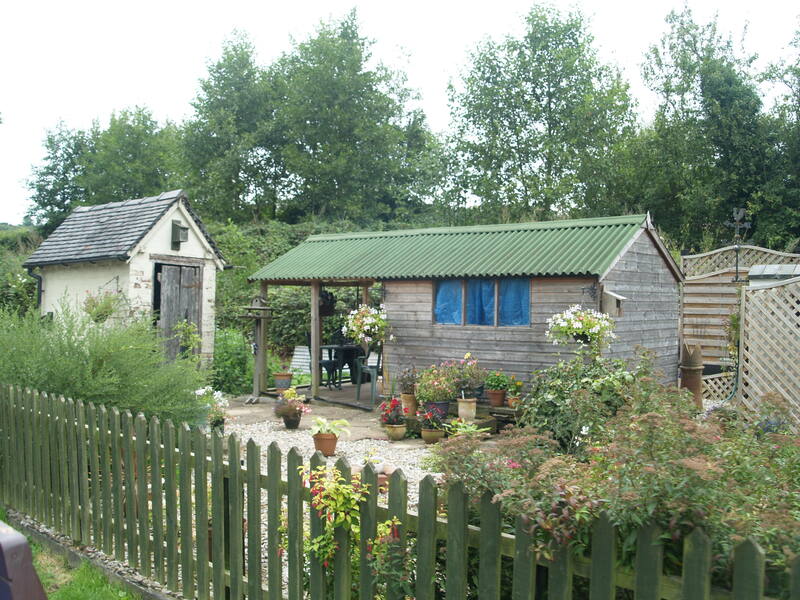 It might not be the cheapest place but local veg, good butcher and they bake their own pies and cakes and bread. I have a fondness for real faggots and love the different taste from one butcher to another, provided they do their own. Faggots are some times called savoury ducks too. The faggots at Great Haywood farm shop are excellent. We also had a free range pork pie which was excellent as well. If you like quality food it is a great place to shop. The ice cream is worth a try if you like that sort of thing. 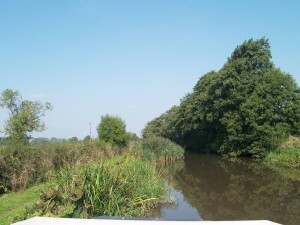 We pottered up the Trent and Mersey my friends loved the views and the pace and Tom was picking out the places to fish as he’s a keen angler. 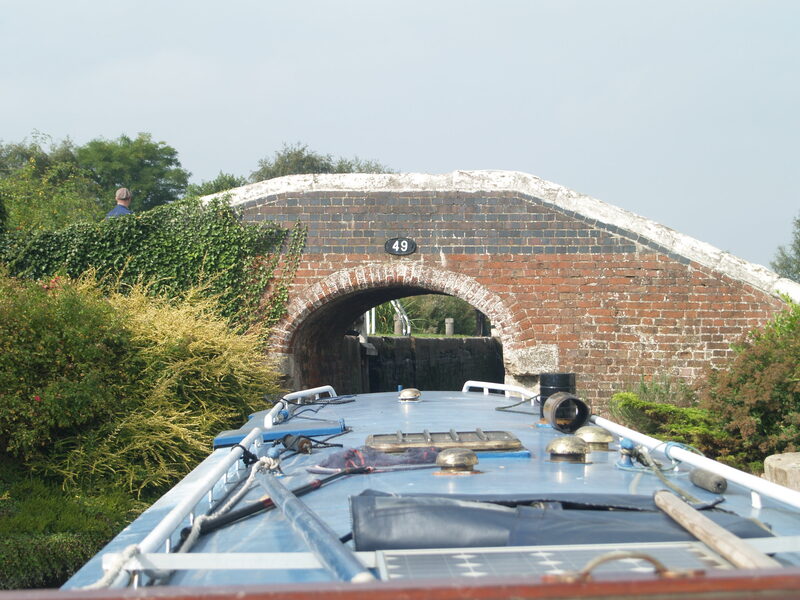 I had to do a little reversing again meeting another boat at a bridge with not a lot of room but no problems. We only went up to bridge 78 then wynded, is that a real word or not I ask, and came back down. Just a thousand revs most of the time and some good conversation. We turned into the Staffs and Worcester and turned back again at Tixall wide. Then moored up opposite the new cafe next to the farm shop. Time for a spot of dinner now so we walked in to the village where the Fox and Hounds is boarded up so we ended up at he Clifford arms where I called in last year but wasn’t too impressed. Two good things this visit. The main course of steak, mushroom and ale pudding was fine nothing special. The pint of Spitfire was excellent and for a starter I had the creamy garlic mushrooms. Absolutely fabulous. If I call again I might just have two portions of the mushrooms and leave it at that, they were gorgeous. A walk back up the side of the canal and waved my friends goodbye. So I’m afraid not that much to tell you about today. Oh I’ve just remembered. 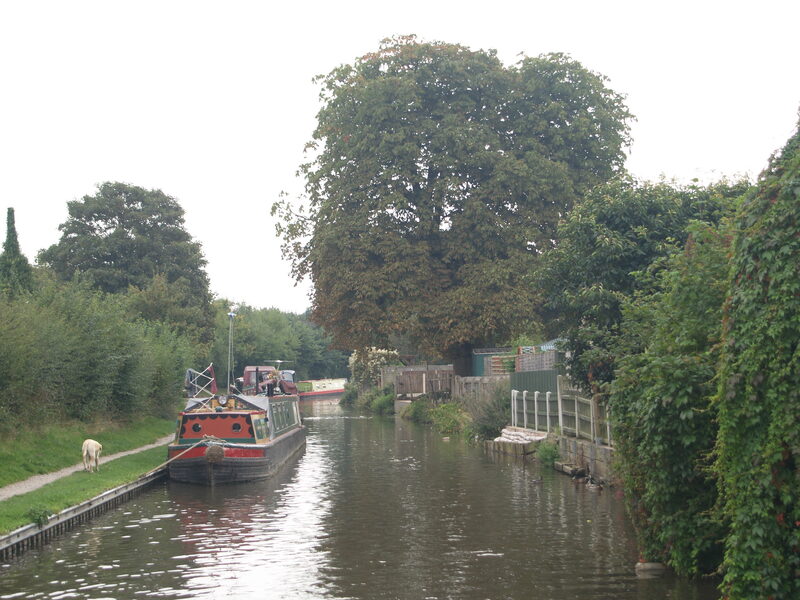 When I got to Shugborough lock this morning a boat came by and they said something then said they read livingonanarrowboat and occasionally blog so I said I would give them a mention. I hope they won’t be offended if I get the names wrong but I think it was Phil and Wendy on narrowboat Top Notch. It’s really nice when you get to meet other site users so if you see me out and about please speak up and introduce your selves. They were heading south as I was going north so I wonder if I’ll see them again on my way back. Photos, I’m sorry they don’t always appear alongside the words that relate to them, I try but with out going mad it’s not feasible. Photo 1. 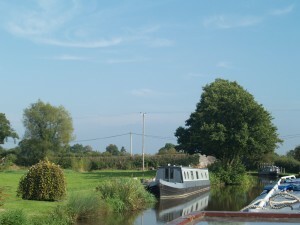 This was last nights mooring I may try to get there again on the way back. 2. garden at the side of the lock. 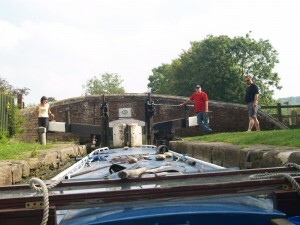 3. the lovely people and their boat that helped me through the lock. 4 and 5 some lovely scenery. 6 I’m sorry. I know I may get excommunicated for this picture but I just love the look of wooden cruisers. 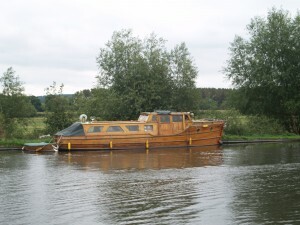 This one moored at Tixall. 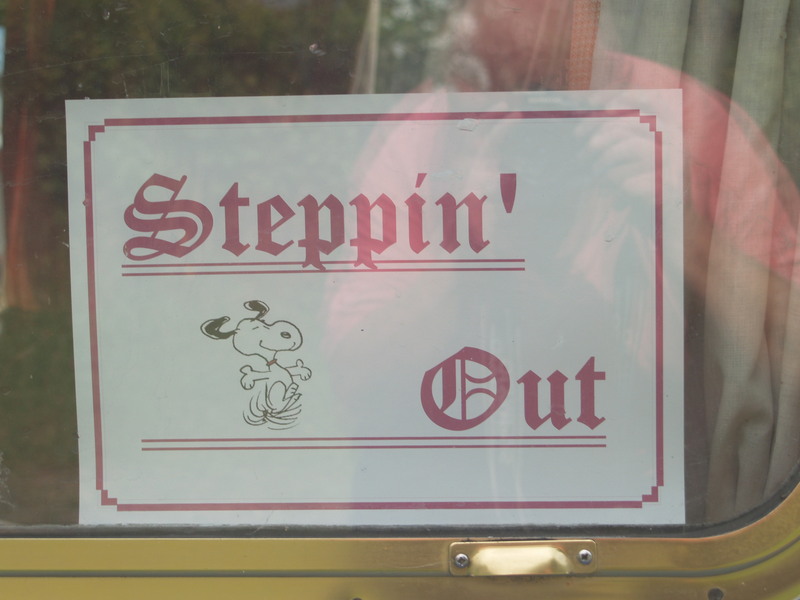 Steppin’ Out; World tour 2014. Day 4, Friday Armitage to Cannock Chase. 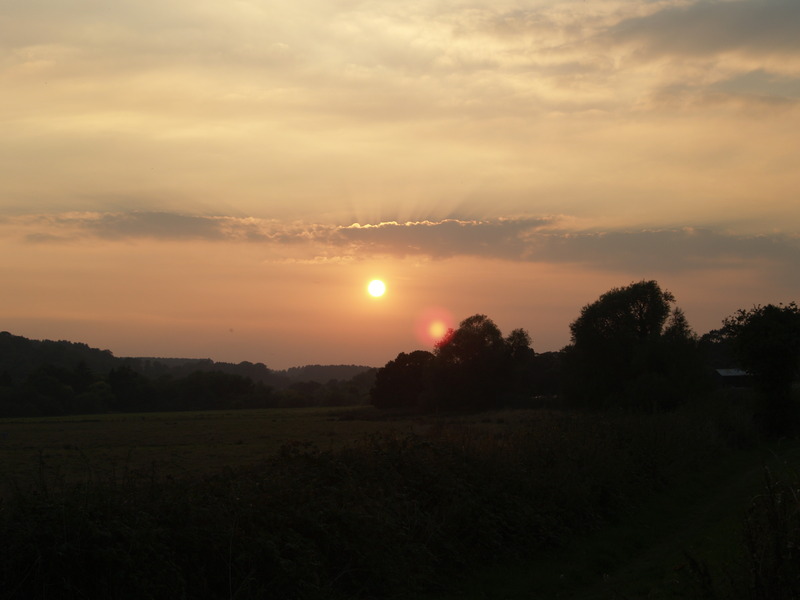 Good evening to you all and a lovely day it’s been. I haven’t travelled far but have got one of my jobs done that I wanted to do in fact maybe nearly two. If you count swabbing down the side of the boat on which I was moored, I might do the other side in a bit or tomorrow as I’m moored on the other side now if I’m making any sense. 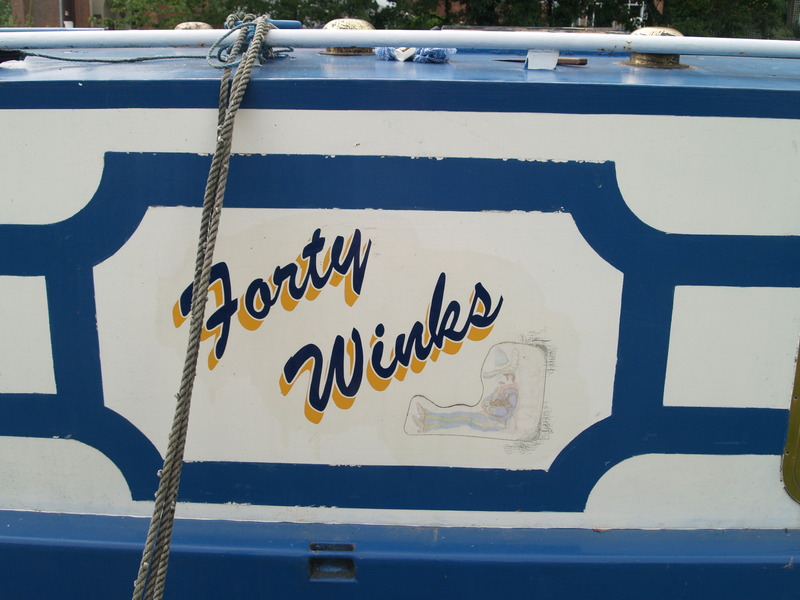 I officially changed my boat name at the beginning of Aug when I renewed my boat license so it is now on my license things you have to display and I’d sanded and scratched one side off and learned how to remove transfers and sticky letters eventually so now I’m out and can get at the other side I decided to get Forty Winks removed all together. A much easier task now I know they are sticky letters and transfers and about an hour of scraping and peeling and the name is no more. A little sad perhaps but Forty Winks meant nothing to me so now she is called “Steppin’ Out” I did consider others but I’ve stepped out in a few ways again lately so it really had to be that and of course all my blogs from the start have been Steppin’ Out so that’s what she’s called now. 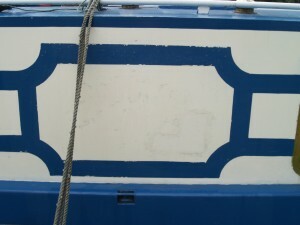 After breakfast and coffee I moved from the Plum Pudding down through the Armitage tunnel, which has no roof?, then moored up opposite Hawkeshead Priory while I remove the stickers and sanded a 4 or 5 bad rust blebs and gave them a spot of primer. 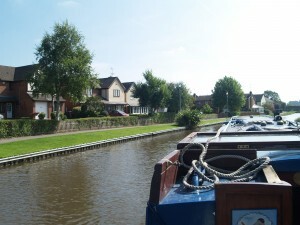 I rang and confirmed my booking for bottom blacking in November at Shobnall marina, tidied things up, had a quick shower then went and filled up with water and we were ready to roll. I’m not sure I can keep this level of excitement up but I’ll try. 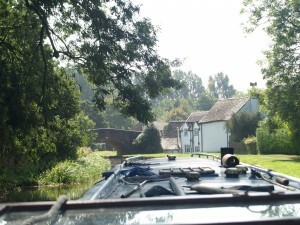 Nasty little bend with bridge as you pull of the water with the Ash Tree pub just on the other side of the bridge. It looks quite nice, a bit modern, theme pub type I think, Brewers Fare or Hungry Horse or something but looks nice. Dawdled up through Brereton where I was nearly involved in a head on crash but they stopped and I stopped with only about 12 feet to spare, my nerves were on edge, my life flashed before me and OK I might be exaggerating a little to raise the viewing figures. I did the gentlemanly thing and reversed back and we all passed pleasantries and we went on our way. Just after this there is someone who keeps birds and he had a couple of Falcons on stands at the bottom near the canal so I took a couple of photos. They are lovely birds, great to see but I’m never quite happy to see things in captivity but they might have been rescued I don’t know. 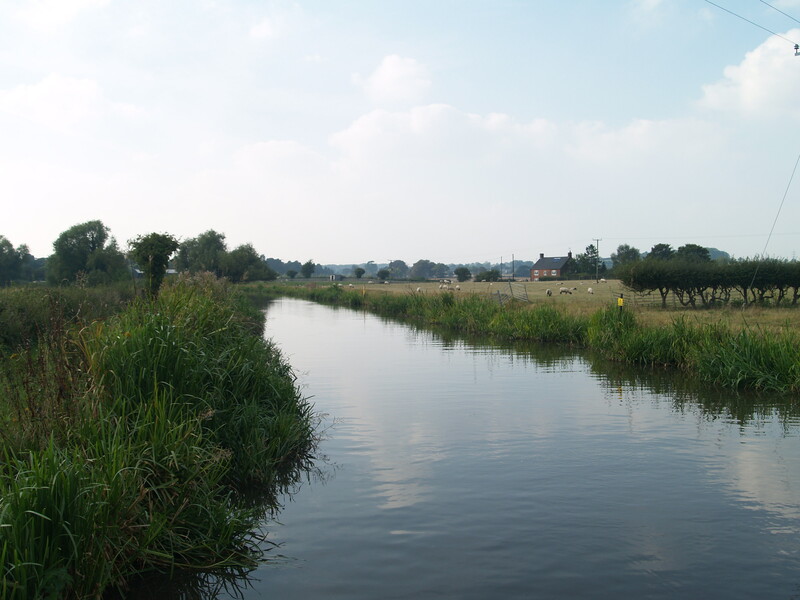 The canal meanders through Brereton, as canals have a habit of doing, and at 2 mph everything looked quite nice and all felt right with the world. 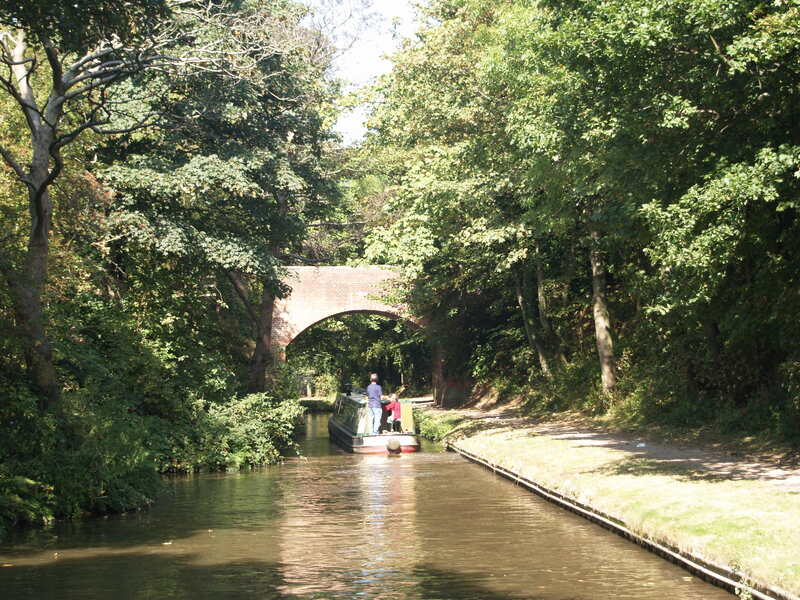 Nothing of outstanding beauty just good old canal type corridor through a little suburban area. Then comes a new bridge straight on top of a high arched old stone bridge which marks the start of Rugeley. 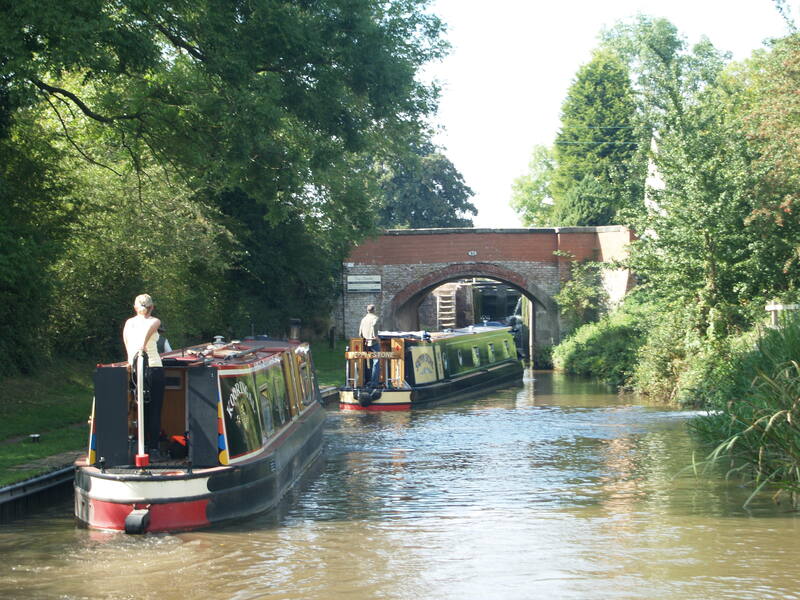 As you go through the bridge and negotiate the corner the canal narrows a little and boats normally moored all the way into the town centre it can be a bit of hassle if there are oncoming boats. There were plenty of spaces to moor today and no one coming the other way so an easy passage for me. A good place to stop here if you want to shop as there are a couple of good sized supermarkets only 2 or 3 hundred yards from bridge 66. Again it is a pleasant passage through the town centre with an array of different houses backing onto the canal. Up past the graveyard then there is a stretch of houses all high up with gardens running down to canal. probably about 40 or 50 foot drop and I found it very interesting to see how each one had tackled this problem and how pleasant it made the last northward part of Rugeley. 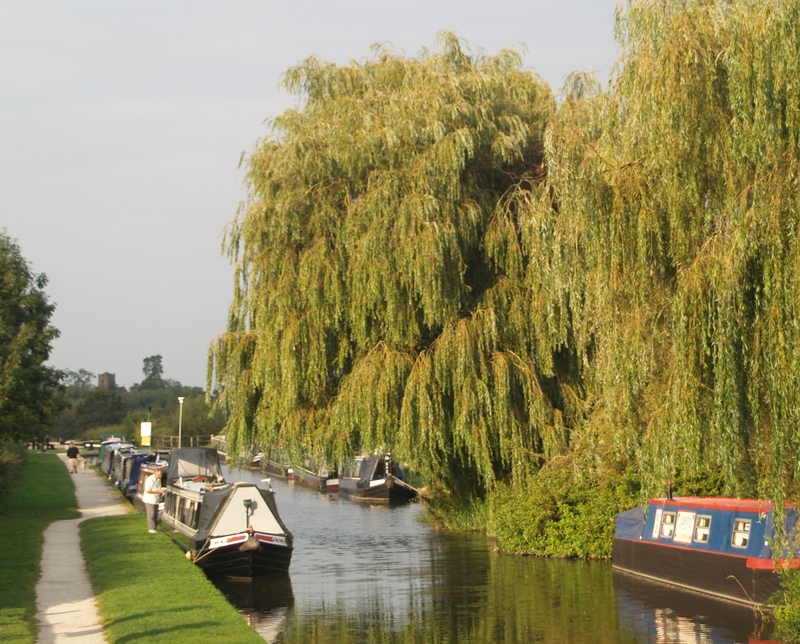 The last thing before you leave is a wonderful old Weeping Willow tree on the waters edge where the canal turns 90 degrees and you pass over the river Trent on a good sized aqueduct and out into the country again. Under a road bridge then round a corner, a little canal bridge and as you pass through turn left and the view just opens out in front of you. 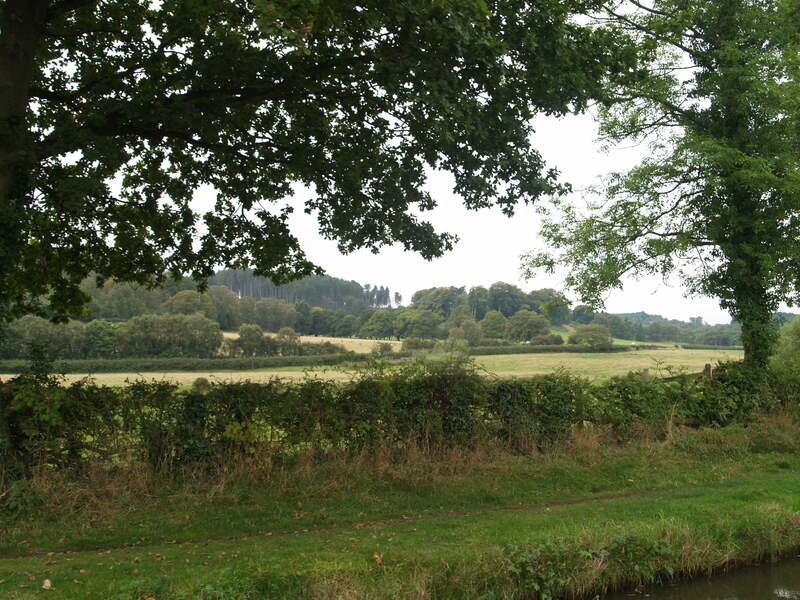 Apparently all this on the left is Cannock chase. There are some nice mown and planked single mooring spots here at nicely spaced intervals. I stopped here for a cuppa last year when I came up this way so I’d decided to overnight here this time. 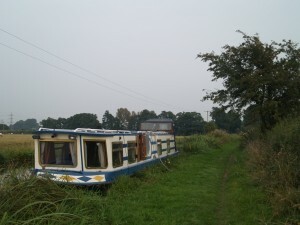 There is another boat in the next one down from me but a good hundred yards and half hidden by the reeds so no problem. I’m sat here writing this and it is so lovely and peaceful with just the odd train passing. The railway line is only a few hundred yards away but again not a real problem. I shall sit back and relax, a glass of something, a strum of the guitar maybe, a few pages of a good book, a nice salad for tea and perhaps an early night and a second glass of something. They don’t write edge of the seat dramas like this any more you know……………… and pleased we all our about that aren’t we boys and girls. A few words of wisdom I picked up recently which hit a chord in me. Everything you hear is an opinion. It is not a fact. Everything you see is a perspective. It is not a truth. Photos 1. how it was. 2 how it is. 3 how it might look next year when painted. 4. A bird of prey. Not really sure which. 5. a nice view and bridge Brereton. 6. The rather nice stone bridge. 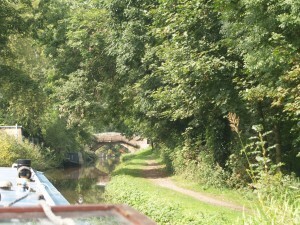 7. the bit up through Rugeley. 8. The Chase opens up. Steppin’ Out; World tour 2014 day 3. Thurs. Alrewas to Armitage. Good evening or morning depending. Day 3 started and finished well but had a little hiccough in the middle. A friend of mine joined me for today and he arrived at about 8.30 so we had a coffee and a bit of a chat to catch up on things. I also tried to explain some of what we would be doing with locks and things. We set off about 11.00, good job it was only a little chat. 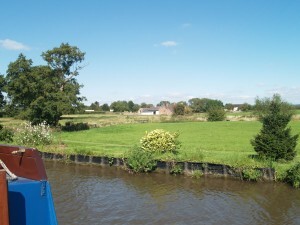 We negotiated Alrewas top lock and set of at a dawdling pace just to enjoy the scenery in the lovely sunshine. Nice and warm again and the world seemed good. We reached Fradley bottom lock and those coming down held the gates for us and we sailed straight in. I’m explaining as best I can about locks and how we do things as it was his first ever day on the canals. Through the second lock and we decided it would be unfriendly not to stop and sample the beer in the White Swan so we moored up. It is an old country style pub with a proper bar and best side and a fine selection of real ales and a landlord with a sense of humour. 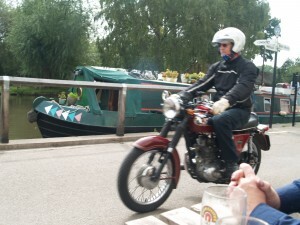 We sat out side in the sunshine and watched a few boats go through and a couple of very nice old motorbikes came past too. A BSA and I think the other one was an AJS if my memory serves me right. Both in really lovely condition and sounding just beautiful. A couple of pints and then head back for the boat which was moored opposite the CRT cafe from which came the smell of bacon. My friend had brought some bacon with him so we had a couple of bacon butties to soak up the beer. We had brown sauce with the bacon which is the only sauce you can have. None of this tomatoe sauce malarky, not on bacon. It’s perfectly al right to have red sauce on sausages, mushy peas, chips or anything else really but bacon has to be brown sauce. I’m not trying to start an argument, I’m just right. After consuming the correctly condimented, afore mentioned sandwiches we set off on our travels. 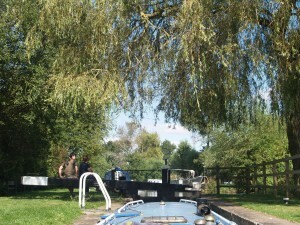 We passed through the next two locks and at Fradley top lock we had our little incident. 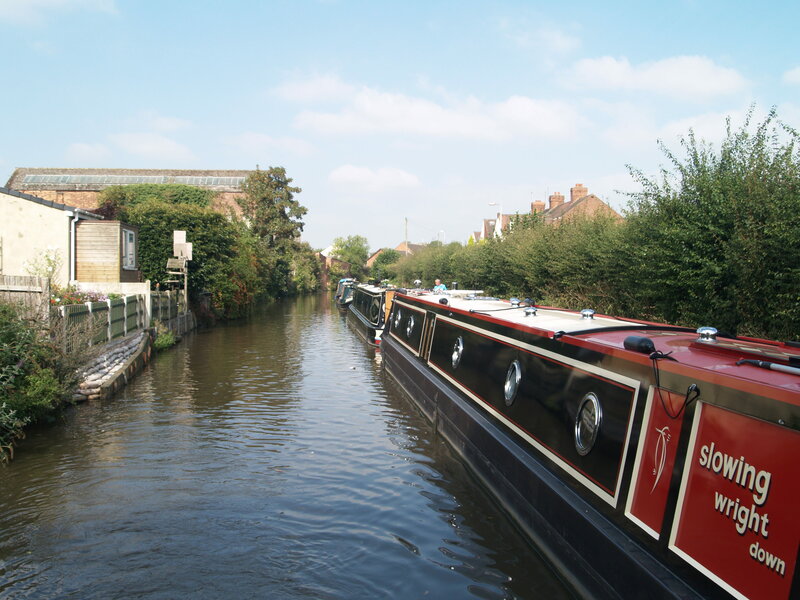 My friend went up to see if the lock was empty while I held the boat and he let the water out and opened the gates and I was half way under the bridge in front of the lock when I could a strange voice shouting and threatening to knock my friend into the lock and a few other things. As I got nearly into the lock so I could begin to see what was happening I shouted up “there’s no need for this” but the chap was marching off still effing an blinding and my mate was stood with the lock gate looking calm if not a little non nonplussed. It appears what had happened was my mate had seen two boats moored up just up from the lock and this other chaps boat was well back from them and he’d assumed he was pulling in so had let the water out. This guy had then come down threatening and swearing and had a right go at him, which I’d heard some of. Once the lock had filled up a bit so I could get off I started walking off towards this guy and the angry man’s wife who was helping my mate with the locks said best just leave him he’ll calm down. I told her I wasn’t going to have a go at him and he was talking to two women coming down after him to come through. 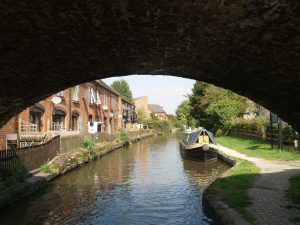 I apologised to him and explained it was my friends first day on the canals and though it wasn’t my first day I’d been explaining as we went along and that if he’d have explained to my mate what he’d done wrong and what he should have done it might have been more helpful. He had calmed down a bit by now and I went back and we bid Mr Angry’s wife farewell and even Mr Angry too. Apparently he had been moving other boats and this was the second time today it had happened. Makes me wonder though if some of the breaches of etiquette that we may get upset about are just because people don’t know what should be done. Maybe we should enquire if they know what the right way is and if not to explain to them instead of either saying nothing or getting a bit angry inside. Shouting, swearing and threatening to drop somebody in the lock isn’t really the right way to do it. Or is it? We poddled on amidst the lovely scenery and past Ravenshaw wood which I think is a lovely spot to moor up at if you like piece and quiet away from anyone. Through more lovely countryside which runs up past King’s Bromley marina all the way to Handsacre. The canal through Handsacre is quite pleasant even under the railway bridge and up past the factory and a little industrial estate. Just before the railway bridge there is another bridge and as there are a couple of turns too we met another boat coming the other way. He was up to the bridge and I’d just got my nose there when we saw each other. We both just about stopped and I started to back up as I deemed I was in a straight enough line to back up onto the side of the canal to let him pass when he waived us on. 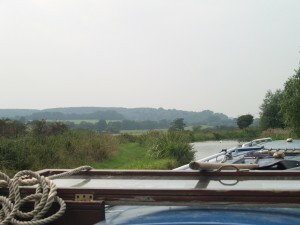 Both boats moved forward very slowly and a little gentle nudging and we both on our way none the worse for anything. Attitude is a wonderful thing. 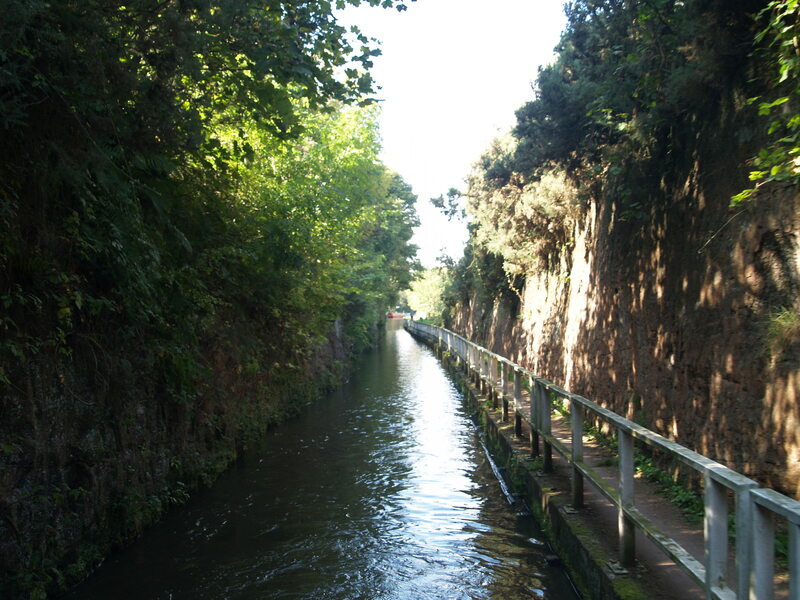 Anyway we trudged on a little further and there gleaming at the side of the canal was our planned destination. The Plum Pudding watering hole. After mooring up and another coffee we decided to try a beer while we waited for my mate’s wife to join us. Inside it was nice and tidy with one side decked out with tables ready for eating. I asked for a couple of menus and the waiter also pointed over to the specials board. We went we looked, and we found out later both had the same though, shoot. The mains on the “special board” were all 5p change from a £20 pound note. I’m showing my class now, or lack of it, but I don’t normally pay that sort of price just for a main course. We took our beer and the menus outside and perused. Not all the meals were that price and it was an Italian restaurant. I had moored on their bit which is reserved for customers so I felt obliged to eat there and the menu descriptions certainly sounded appealing. The young lady arrived and we ordered our meals. I had fillets of beef in a port, brandy and peppercorn sauce which came with sautéed potatoes and vegetables, my friend the lamb shank and his good lady a pasta dish. Everything was delicious if not over the top in size of the portions. Often the case it seems in the more up market establishments. So if you’re passing and want something a little special, they do Tuna steak and Swordfish steak and a good selection of other dishes oh and that includes calamari, or squid if you like. It is worth a look. Quality of food excellent, value a little pricey for me but I think it’s on a par with other Italian restaurants and similar standard places. Good service too. Time for bed said Zeberdee, aah the voices return said OurNige and headed for the gin bottle. Steppin’ Out; World tour 2014 day 2, Burton to Alrewas, nice people. Hi it’s been a warm and lovely day with a few people restoring my faith in the human race. Rudely awakened by the building site, opposite where I moored last night, at 7.30 but hey ho it’s a nice morning. A cup of milky coffee and grapes, yoghurt and honey for breakfast. 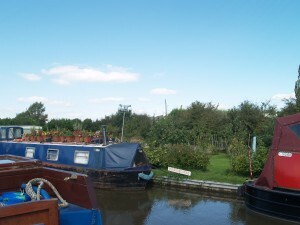 After which I trot off to Shobnall marina and purchase a couple of the chains with rings on for mooring up. Inquired about boat blacking and he has a slot in November which should suit. Must remember to ring him back tomorrow to book it. Off up the jolly old cut and Branston lock where a boat was moored on lock moorings but he’d come through and I’m sure he was just getting on board and he went back and opened the gates for me. What a gentleman. I thanked him profusely. Only about 1/2 mile further along and a father with his two kids were fishing and the young lad about 10 or 12 thanked me for slowing down. Some nice youngsters about but we don’t always notice them like we do the others. Through Tatenhall lock where I was helped by the guy coming down and then down to the noisy part where the canal runs alongside the A38. It’s quite strange how the wildlife and the plants and trees still seem serene, gentle and soothing even though the noise is loud. You can still hear the birds and the ducks just pay it no mind at all. Through Barton Turns lock and then on to Wychnor lock which if you look as you approach it you can see the water getting clearer as this is the last lock before the river Trent which feeds the lowest bit of the Trent and Mersey. I like the bit after the lock as the water is clearer still. Some nice linear private moorings top side of the lock. Then the dangerously exciting bit as we cross the Amazon river. Oh sorry it’s the Trent and actually not a problem at all apart form me having a blond moment as I’m crossing and had a momentary panic attack as I couldn’t see where the exit from the river was. I shouldn’t really be out on my own. I hadn’t been under way much more than 3 hours and I could feel myself wanting to nod off. Moored up and went up to the lock and started opening one of the paddles to let the water out and never noticed a boat coming down. Good job he shouted. I just wasn’t with it. Obviously I closed the paddle and helped them through. So remember don’t shout at all the numpties as they might just be having an off day or it might actually be me. 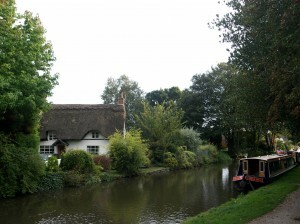 Alrewas is a very picturesque village with some nice and expensive houses overlooking the canal. I found a mooring next to the church and graveyard so should be quiet over night. There are 4 pubs in Alrewas I believe and I’ve sampled the beer in 2. The George and Dragon and the William IV both are nice and friendly pubs. They have a good, proper butcher on the main road through along with a post office and a couple of small supermarket shops. Not a bad little place to stock up if your provisions are low and you’re down to a couple of cream crackers and a sliver of dry cheddar. That’s it for tonight as I’m tiring now and need to grab a bite to eat and early night. Photos; 1 approaching Tatenhall lock. 2 approach to Alrewas bottom lock. 3 a lovely part of Alrewas. 4 my mooring for the night Steppin’ Out being the one with the hood. 5. 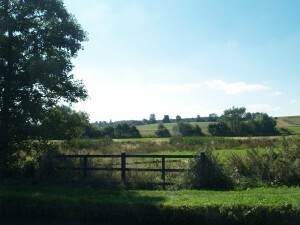 Looking down towards Alrewas bottom lock.